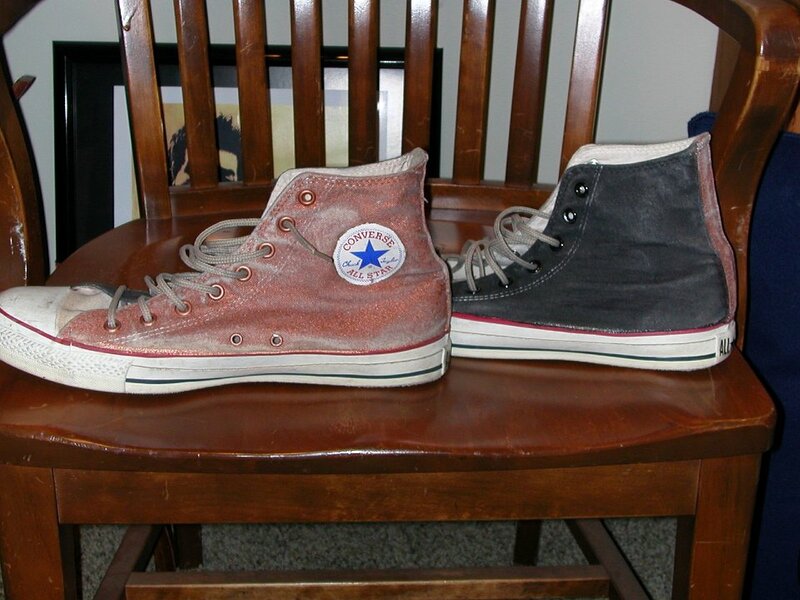 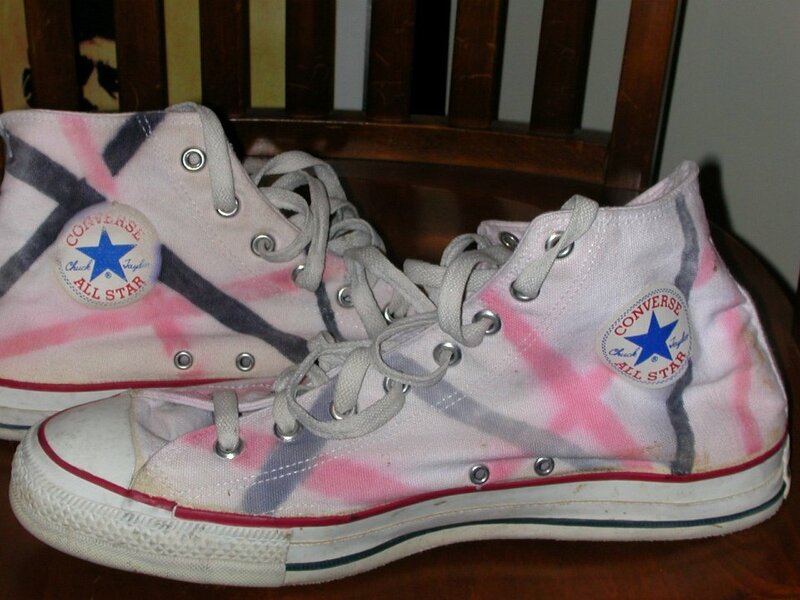 Photo gallery of Brad Deniston's collection of chucks. 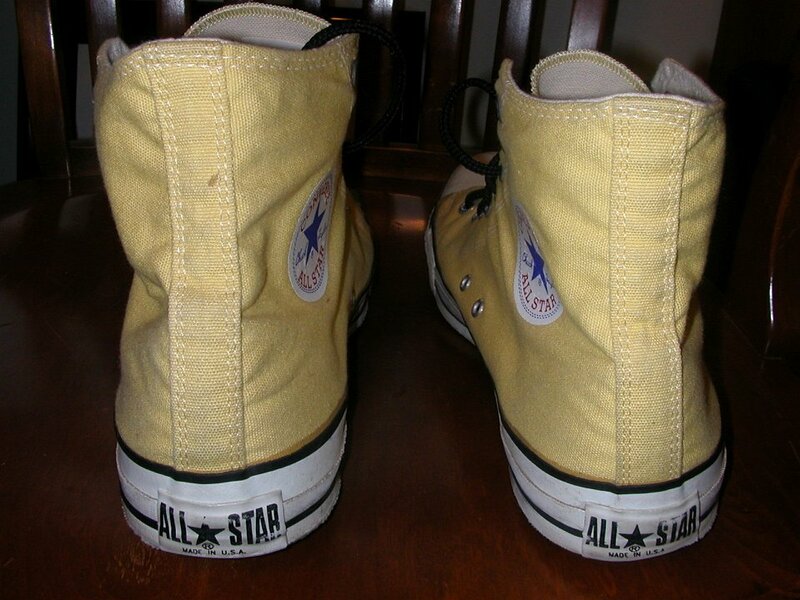 1 Brad Deniston Collection of Chucks Rear view of banana yellow high tops. 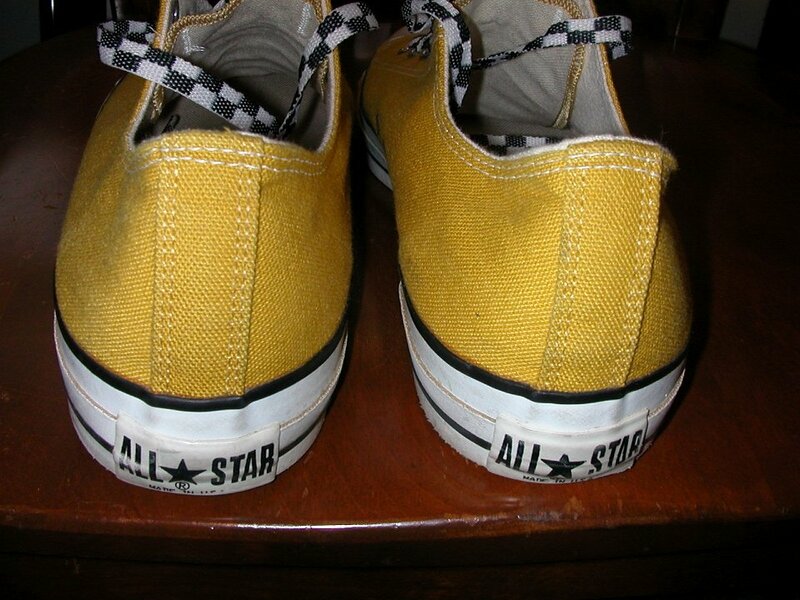 2 Brad Deniston Collection of Chucks Inside patch views of banana yellow high tops with narrow black shoelaces. 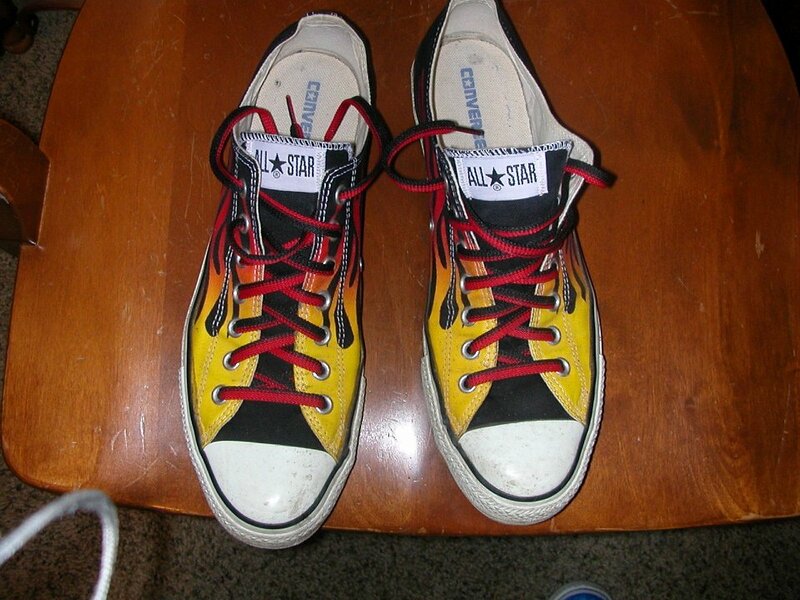 3 Brad Deniston Collection of Chucks Top view of banana yellow high tops with narrow black shoelaces. 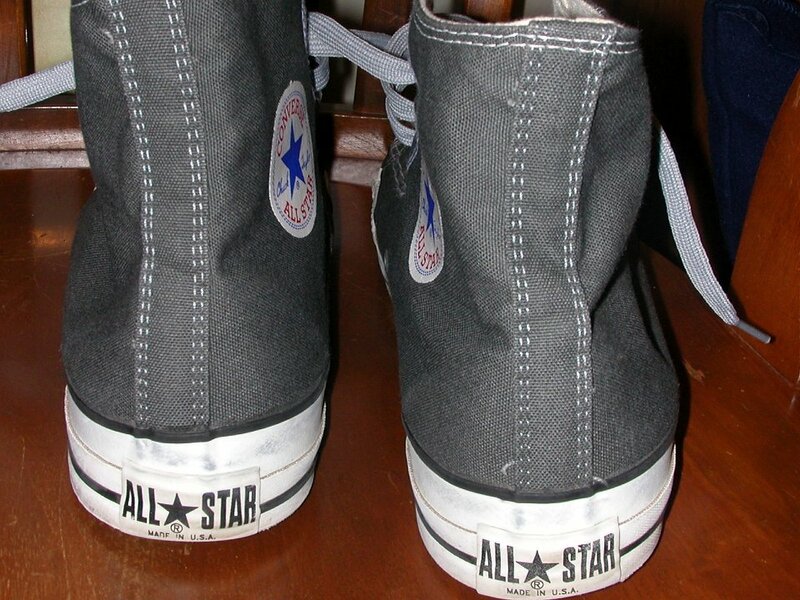 4 Brad Deniston Collection of Chucks Top view of black low cuts with grey shoelaces. 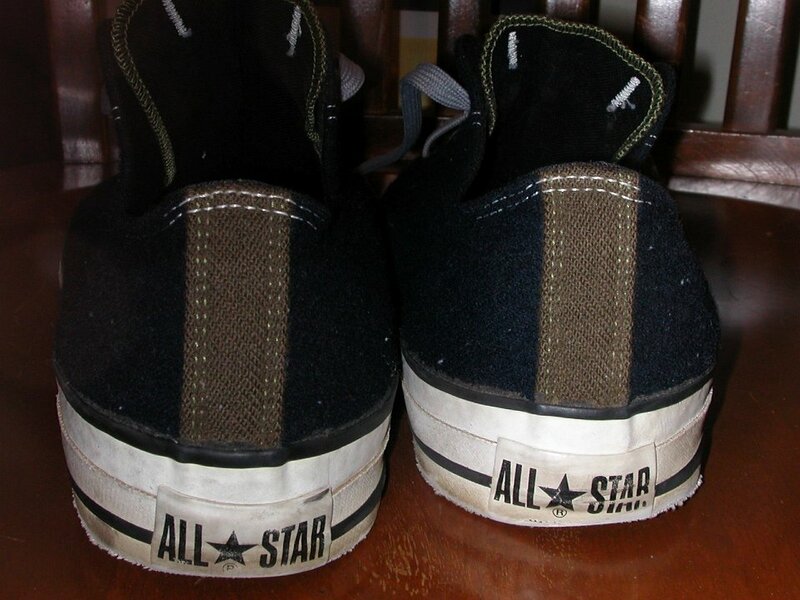 5 Brad Deniston Collection of Chucks Rear view of black low cuts with olive trim. 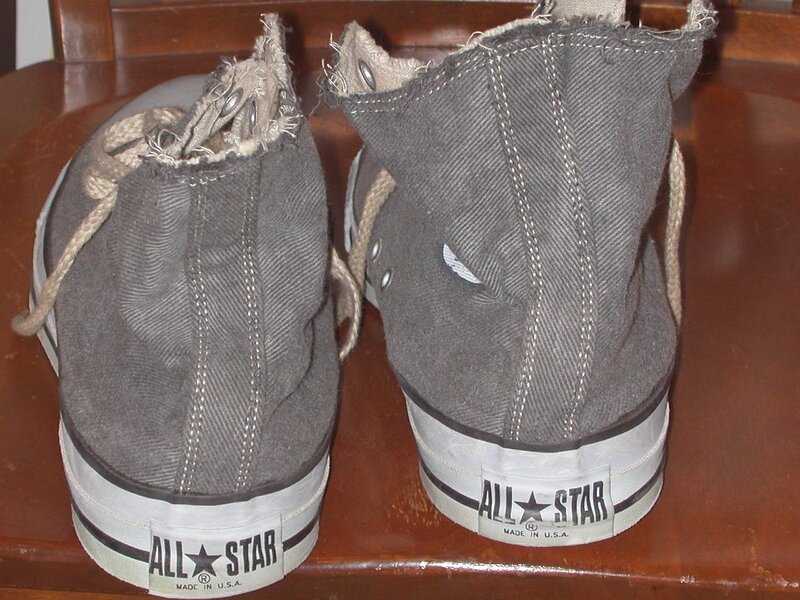 6 Brad Deniston Collection of Chucks Inside patch views of distressed black denim high tops with hemp shoelaces. 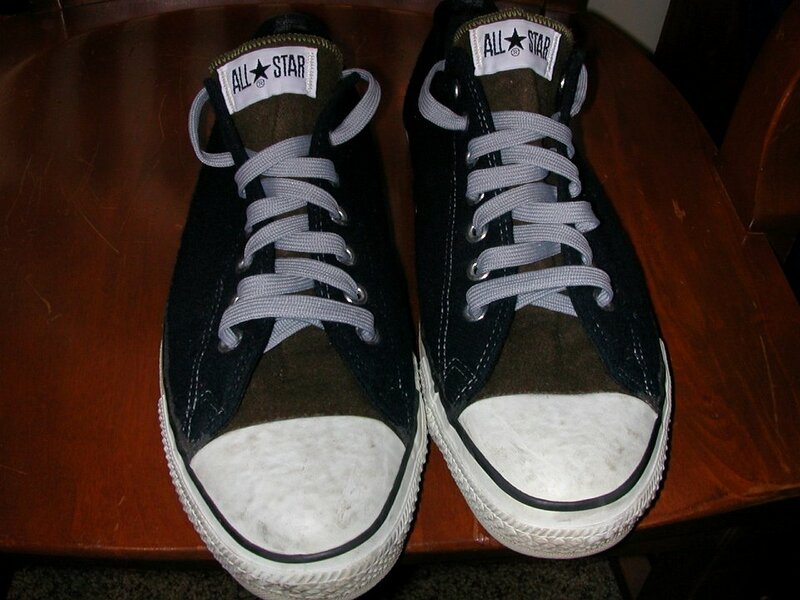 7 Brad Deniston Collection of Chucks Rear view of distressed black denim high tops with hemp shoelaces. 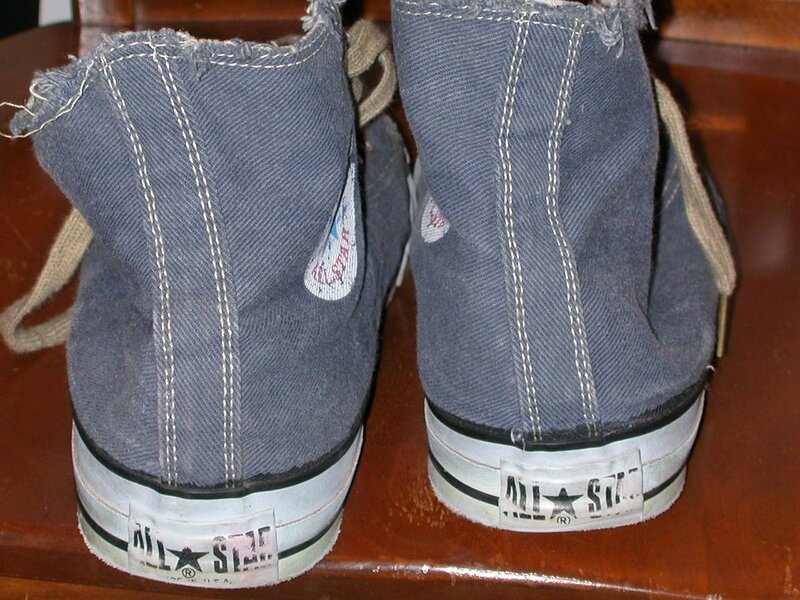 8 Brad Deniston Collection of Chucks Rear view of distressed blue denim high tops with hemp shoelaces. 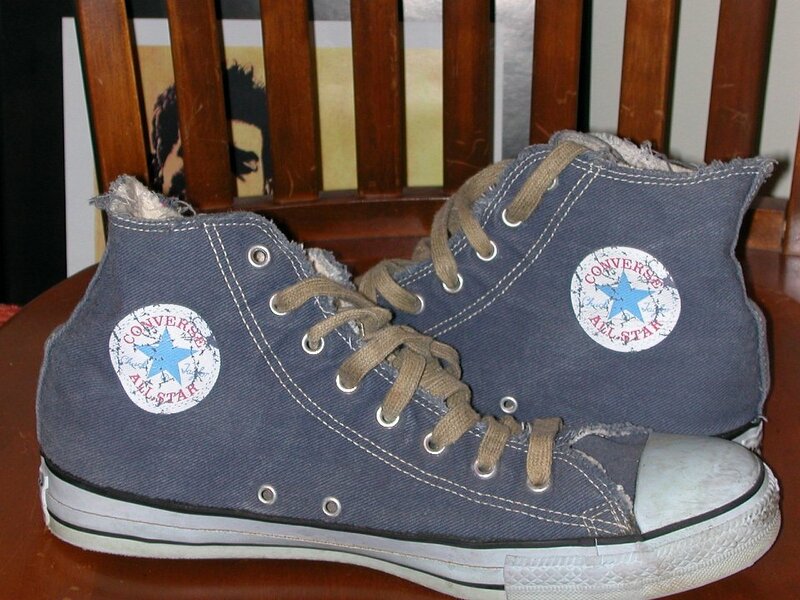 9 Brad Deniston Collection of Chucks Inside patch views of distressed blue denim high tops with hemp shoelaces. 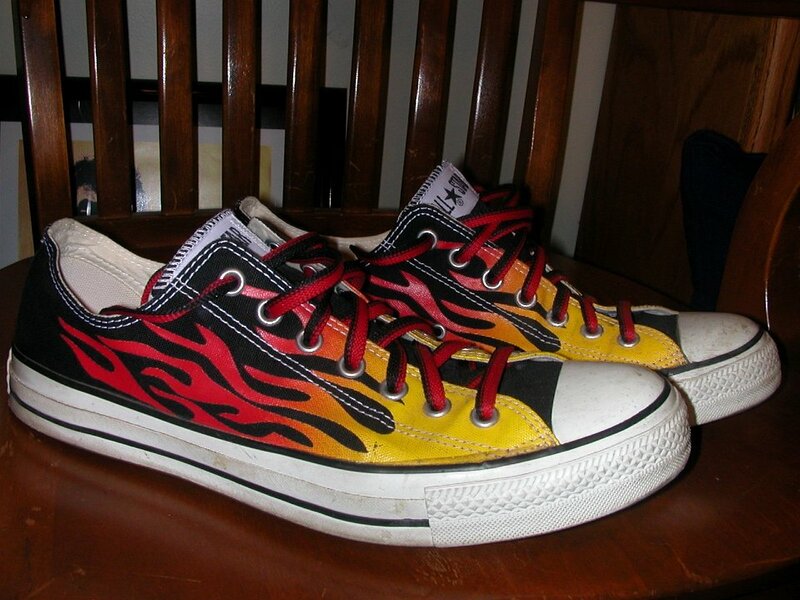 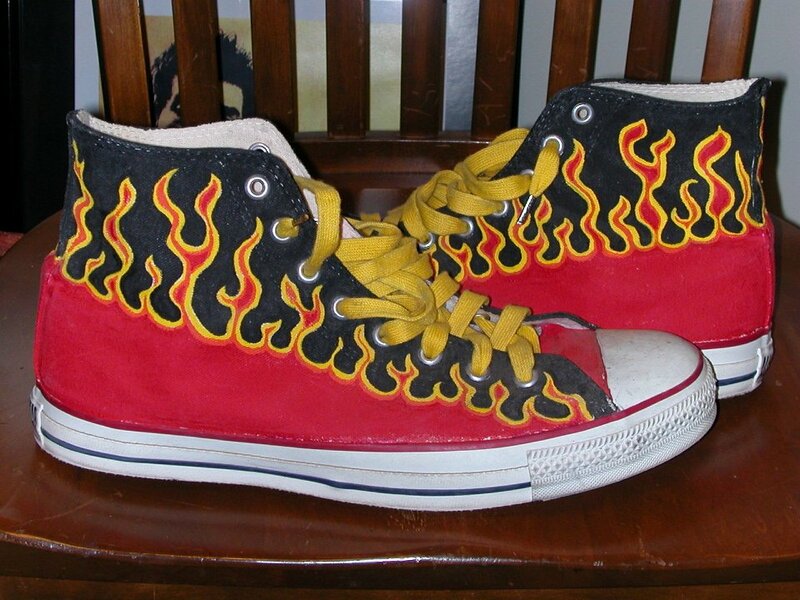 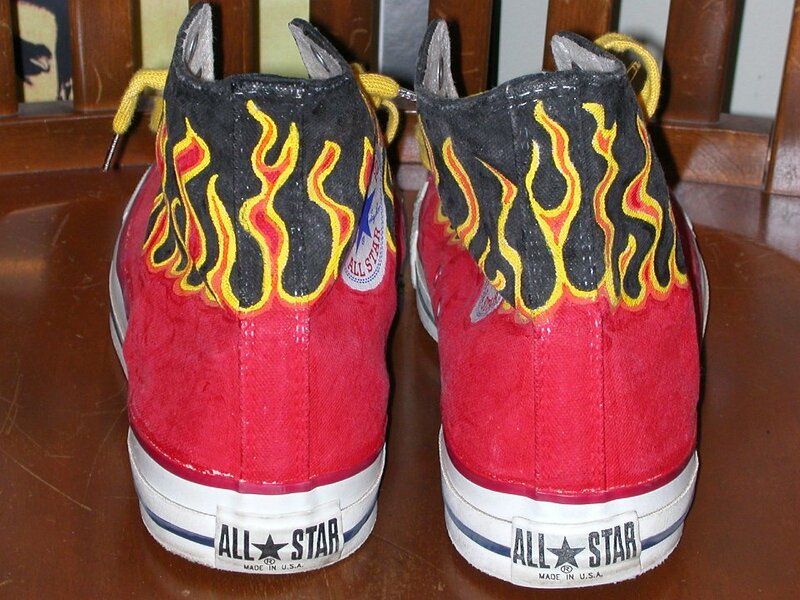 10 Brad Deniston Collection of Chucks Side view of black flames low cut with chucks black and red reversible shoelaces. 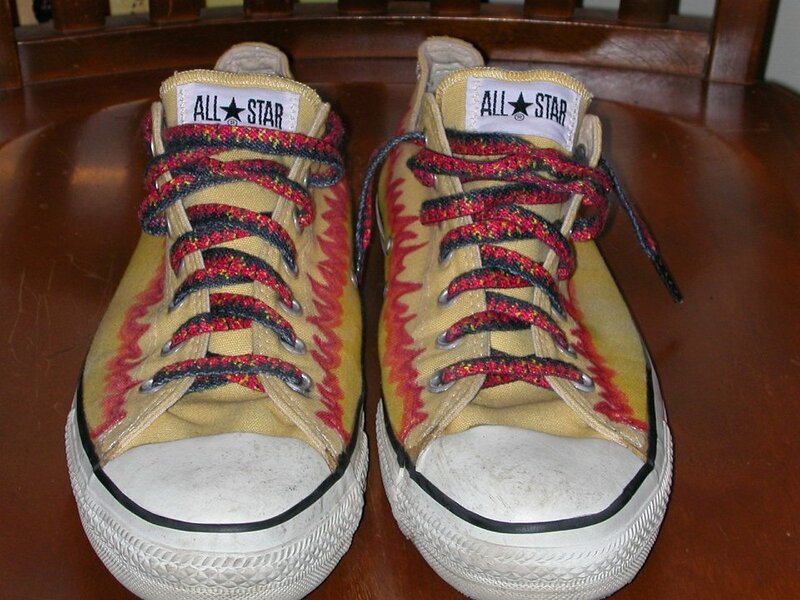 11 Brad Deniston Collection of Chucks Top view of black flames low cut chucks with black and red reversible shoelaces. 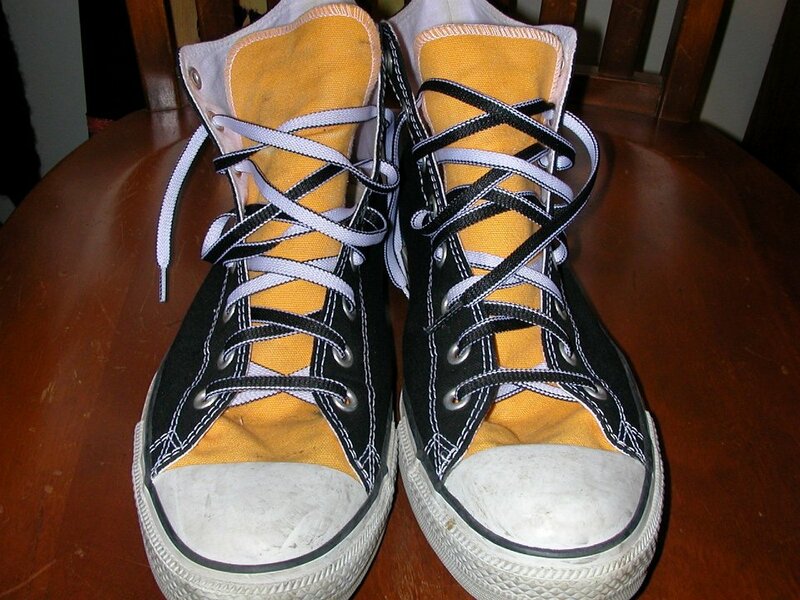 12 Brad Deniston Collection of Chucks Front view of black and gold 2-tone high tops with black and white reversible shoelaces. 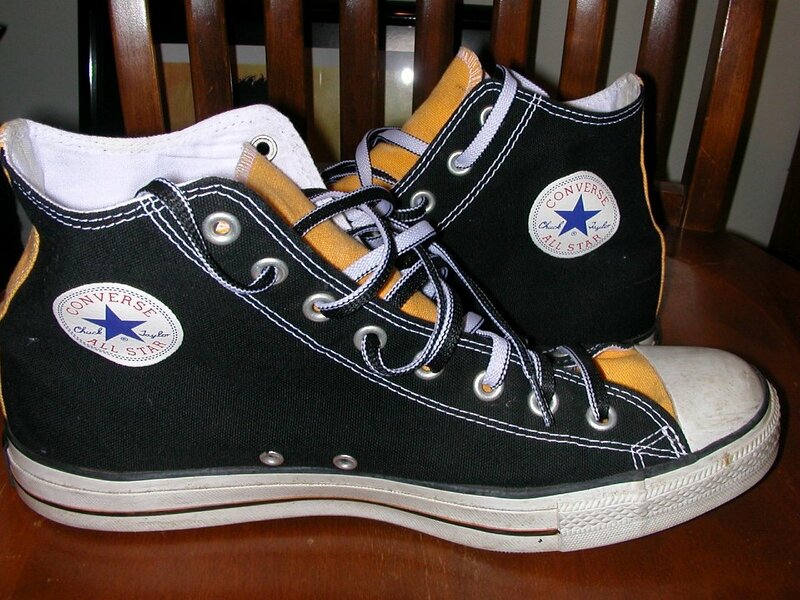 13 Brad Deniston Collection of Chucks Inside patch views of black and gold 2-tone high tops with black and white reversible shoelaces. 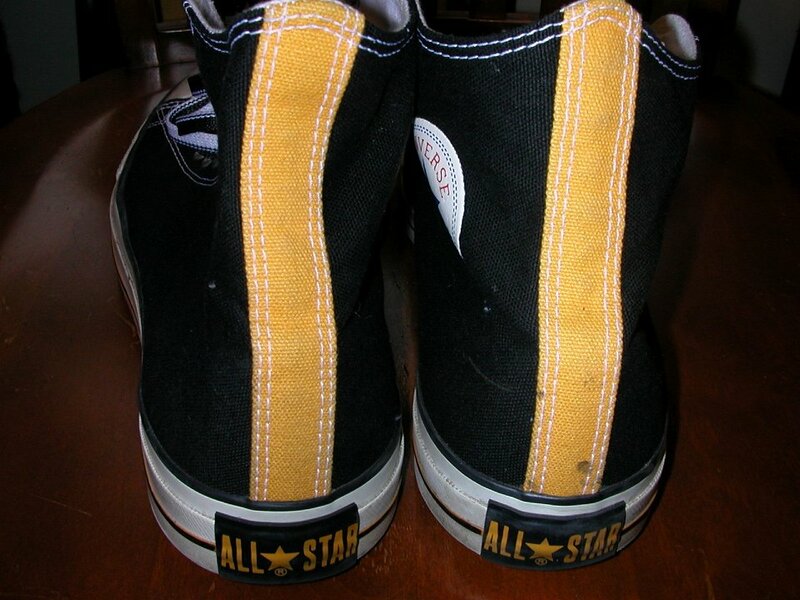 14 Brad Deniston Collection of Chucks Rear view of black and gold 2-tone high tops with black and white reversible shoelaces. 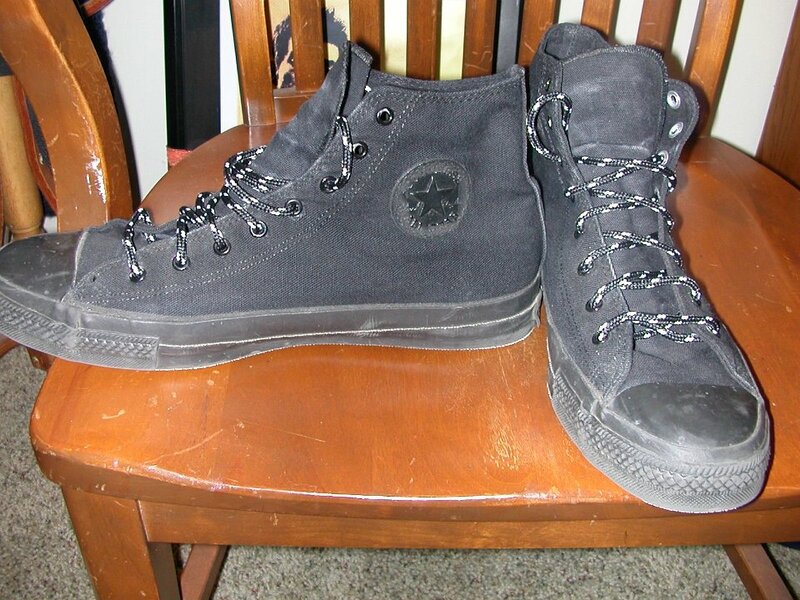 15 Brad Deniston Collection of Chucks Rear view of black hemp low cut chucks. 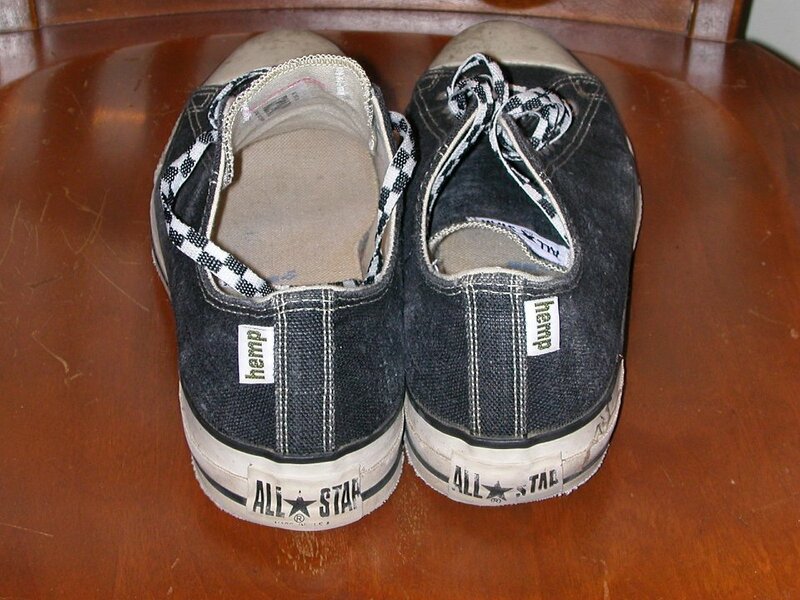 16 Brad Deniston Collection of Chucks Rear view of black hemp low cut chucks with checkered laces. 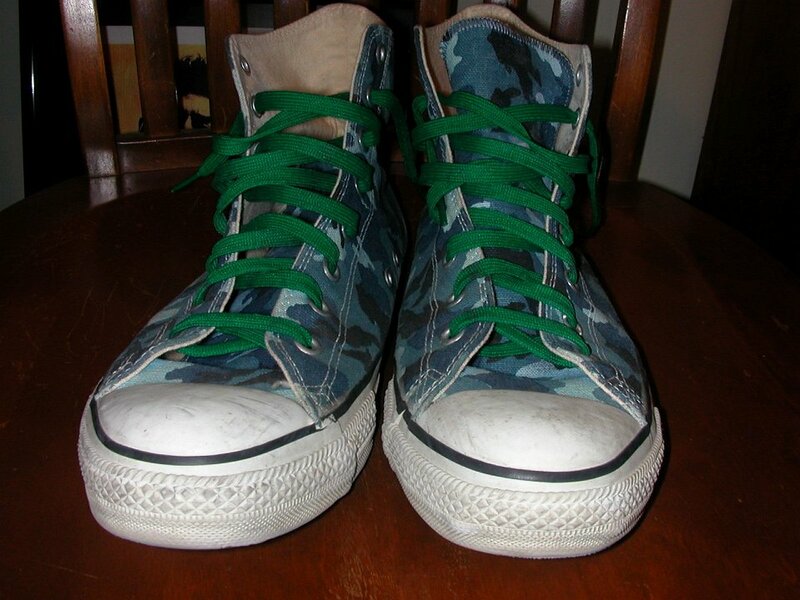 17 Brad Deniston Collection of Chucks Front view of blue camouflage high tops with green shoelaces. 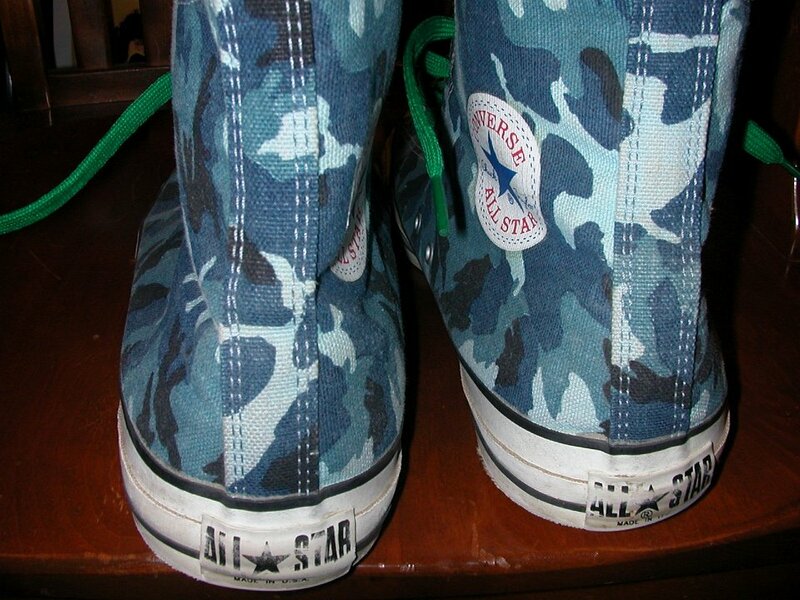 18 Brad Deniston Collection of Chucks Rear view of blue camouflage high tops with green shoelaces. 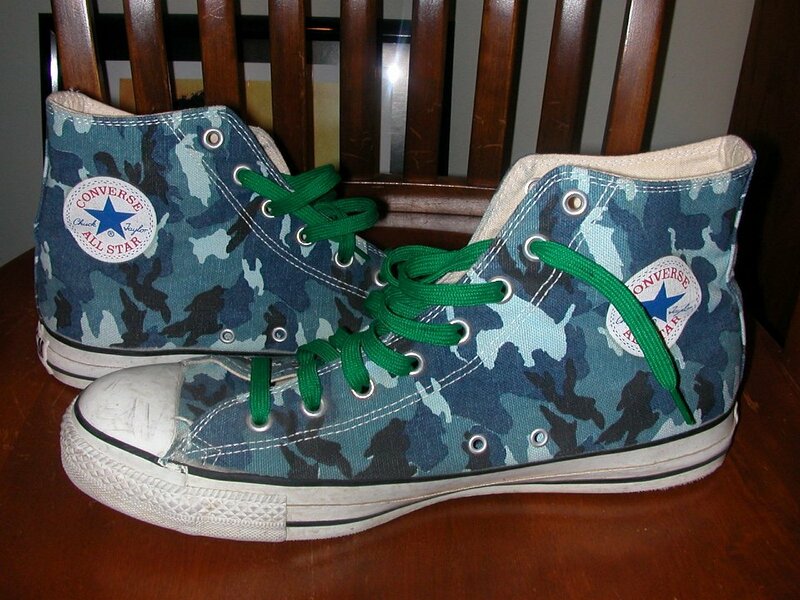 19 Brad Deniston Collection of Chucks Inside patch views of blue camouflage high tops with green shoelaces. 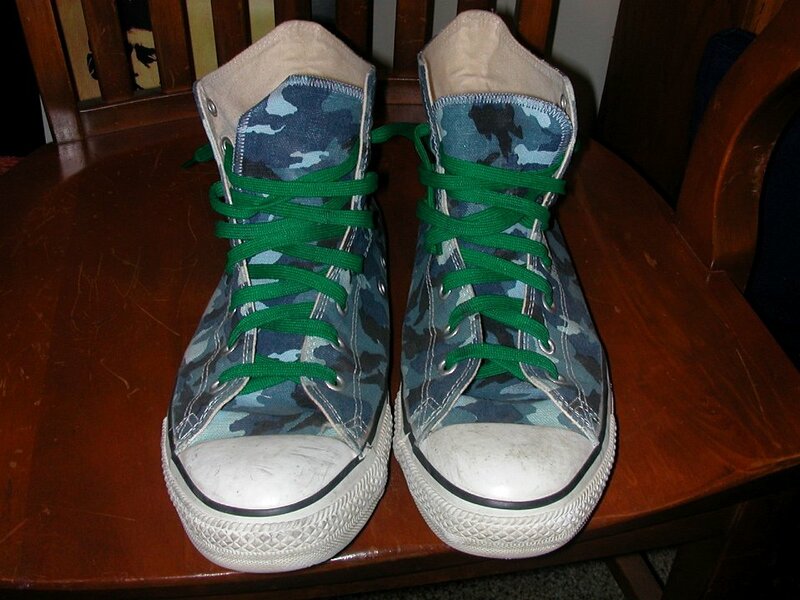 20 Brad Deniston Collection of Chucks Rear view of blue camouflage high tops with green shoelaces. 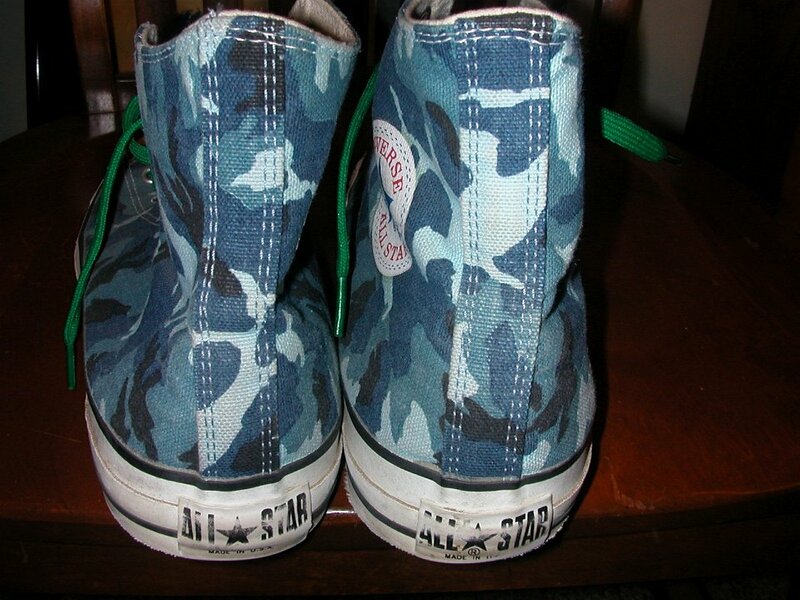 21 Brad Deniston Collection of Chucks Inside patch views of blue camouflage high tops with green shoelaces. 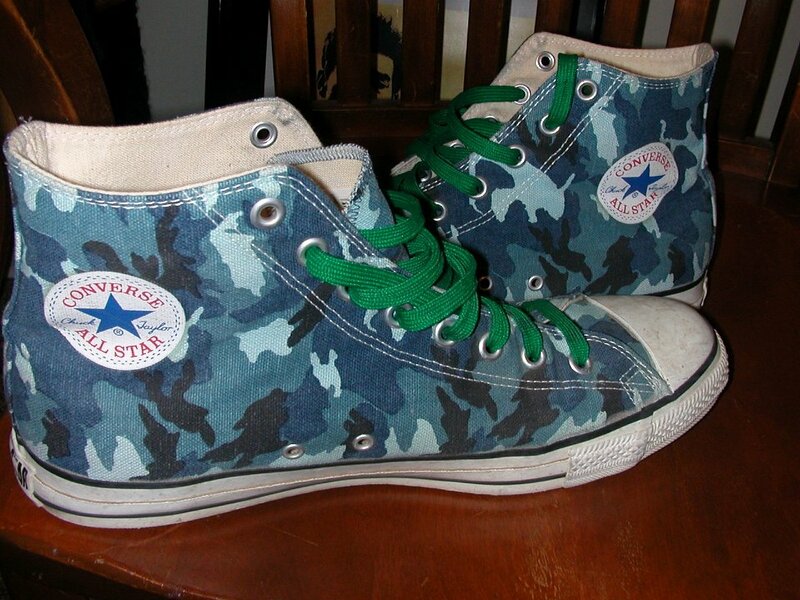 22 Brad Deniston Collection of Chucks Top view of blue camouflage high tops with green shoelaces. 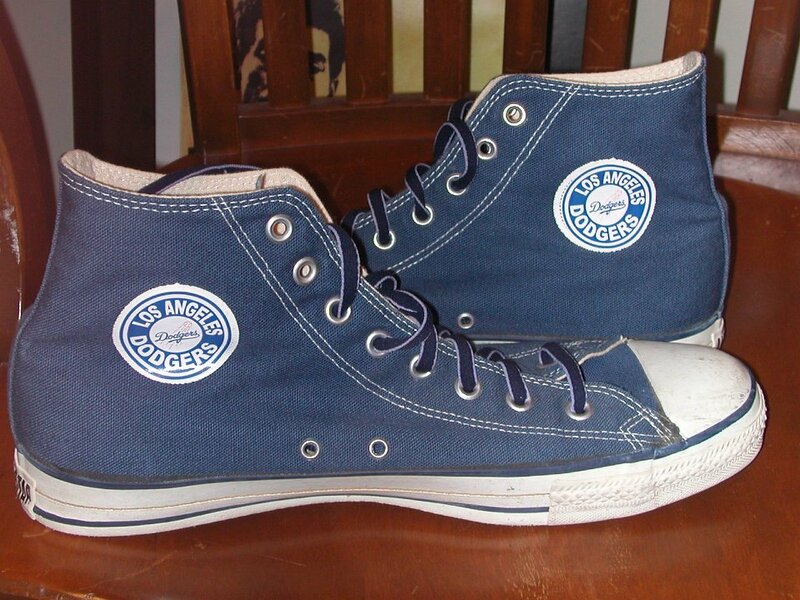 23 Brad Deniston Collection of Chucks Inside patch views of Los Angeles Dodger blue high tops. 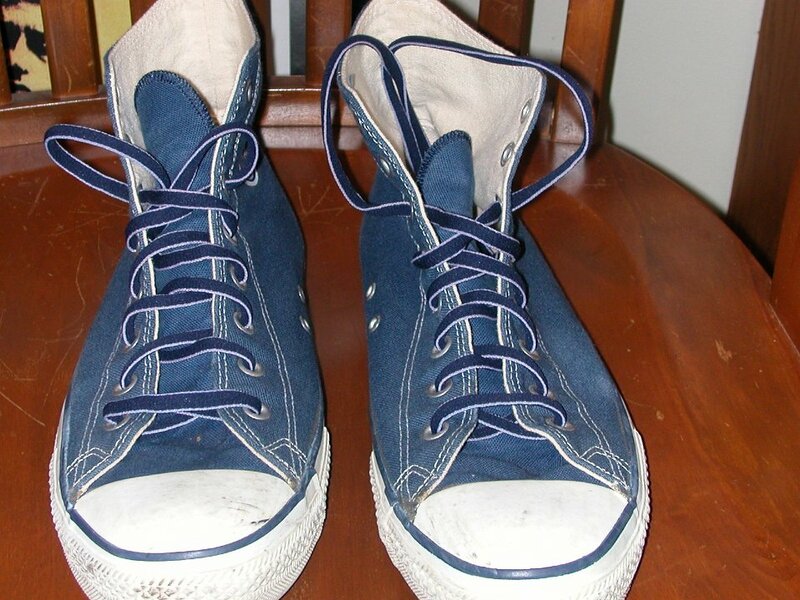 24 Brad Deniston Collection of Chucks Front view of Los Angeles Dodger blue high tops. 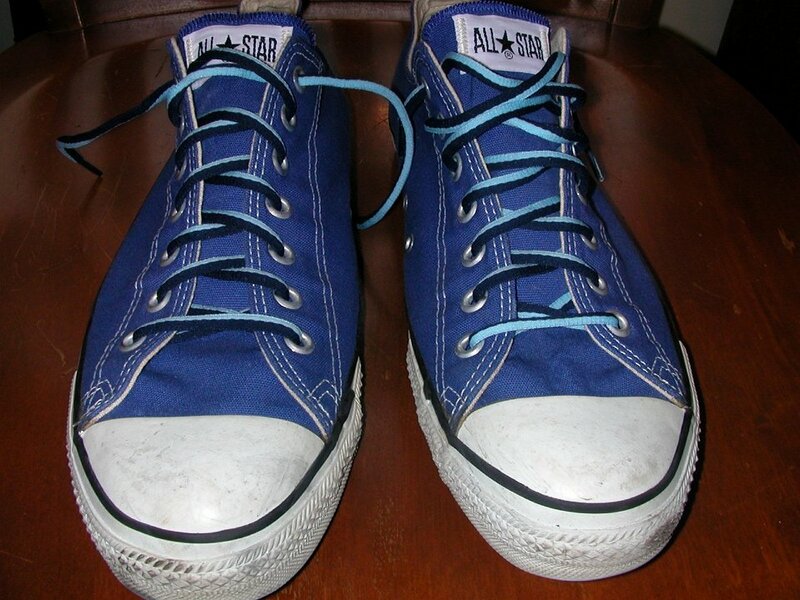 25 Brad Deniston Collection of Chucks Rear view of Los Angeles Dodger blue high tops. 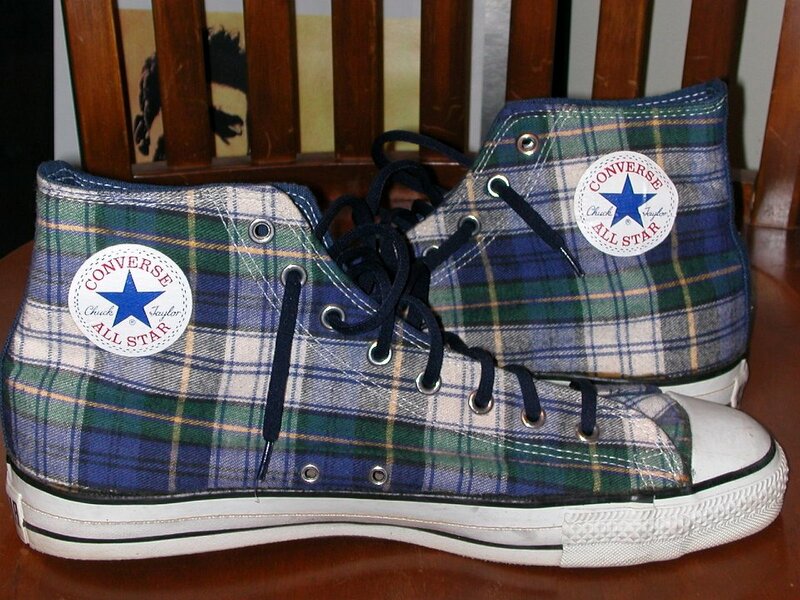 26 Brad Deniston Collection of Chucks Rear view of blue plaid high tops. 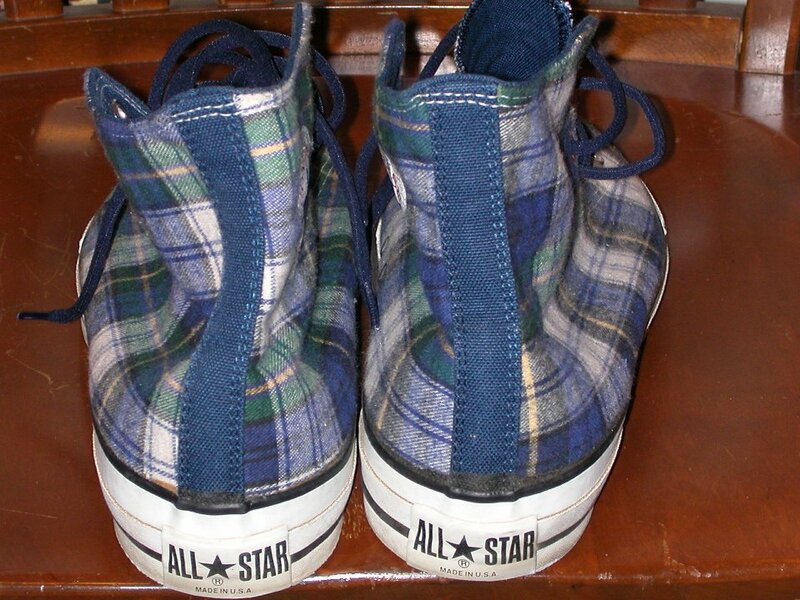 27 Brad Deniston Collection of Chucks Inside patch views of blue plaid high tops. 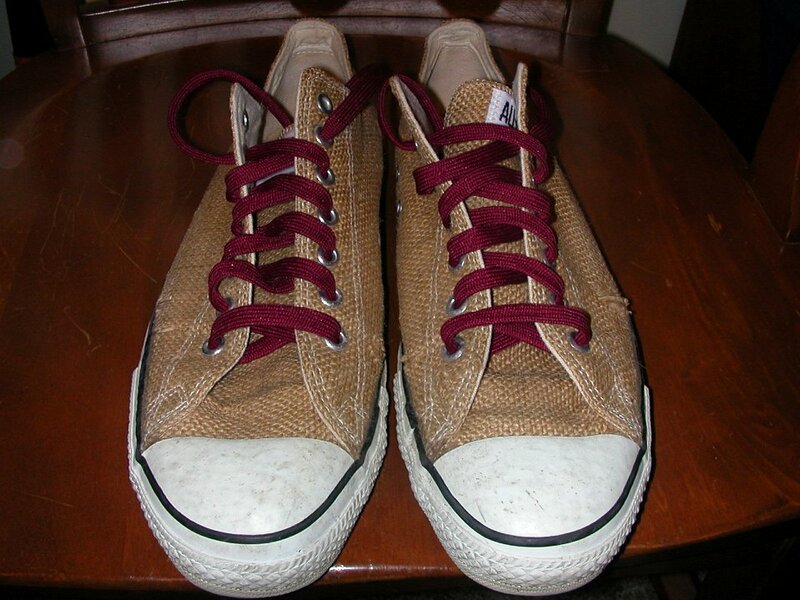 28 Brad Deniston Collection of Chucks Inside patch views of brown leather Euro high tops. 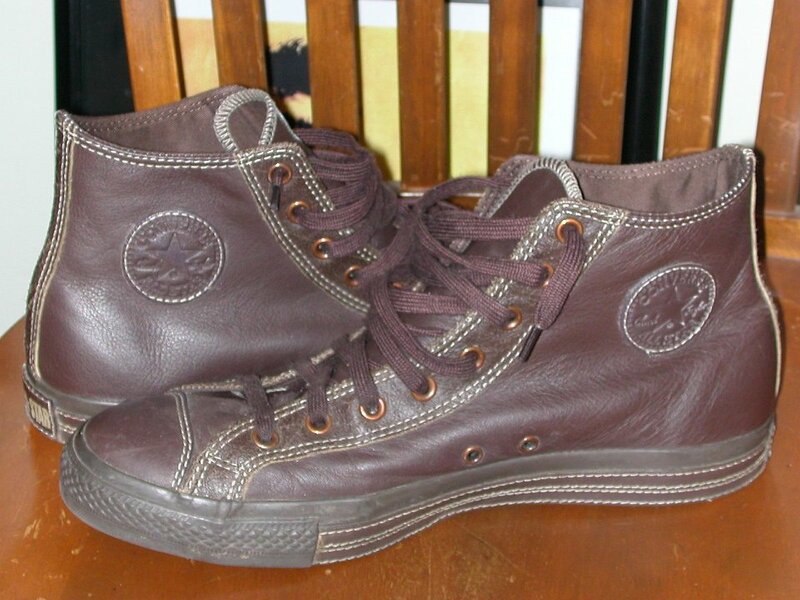 29 Brad Deniston Collection of Chucks Rear view of brown leather Euro high tops. 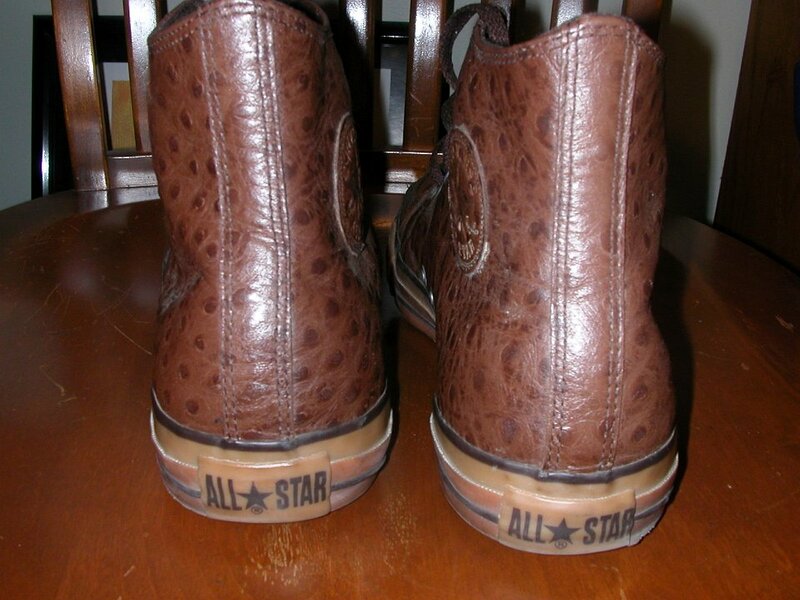 30 Brad Deniston Collection of Chucks Rear view of brown leather high tops. 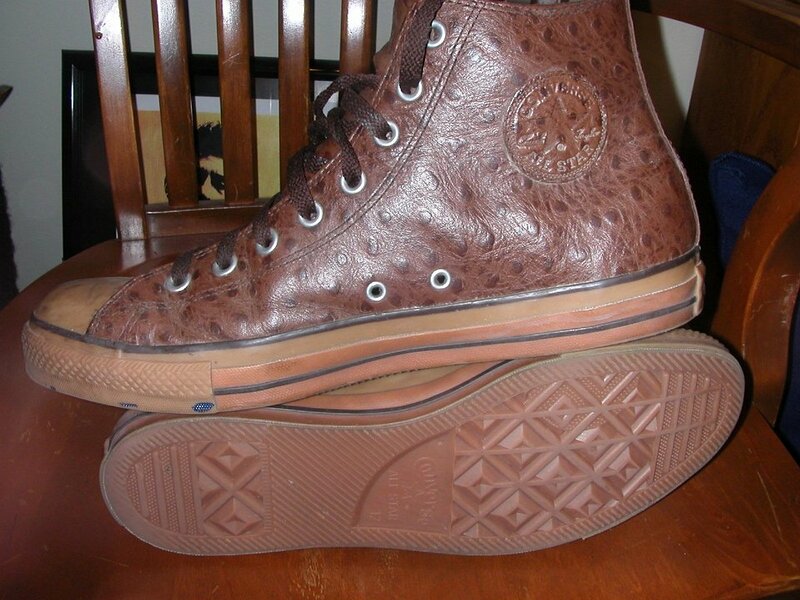 31 Brad Deniston Collection of Chucks Inside patch and sole views of brown leather high tops. 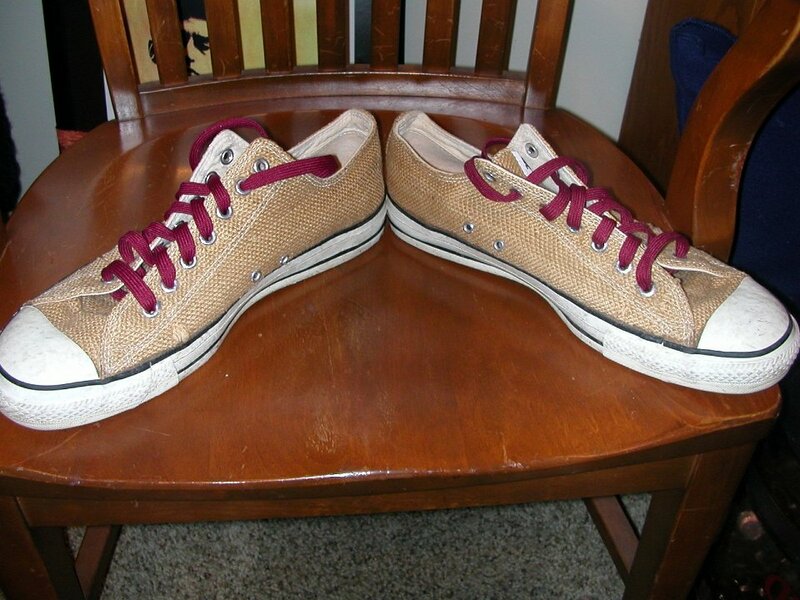 32 Brad Deniston Collection of Chucks Top view of burlap low club chucks with maroon laces. 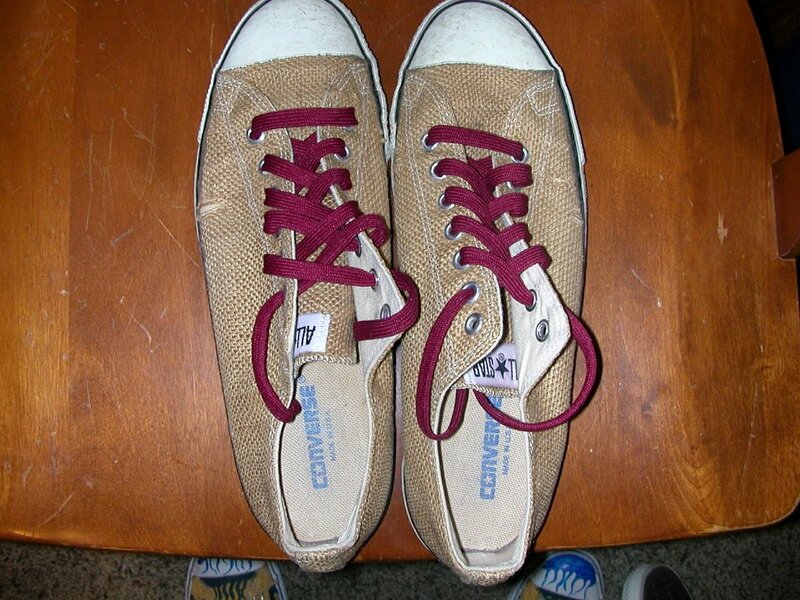 33 Brad Deniston Collection of Chucks Top view of burlap low club chucks with maroon laces. 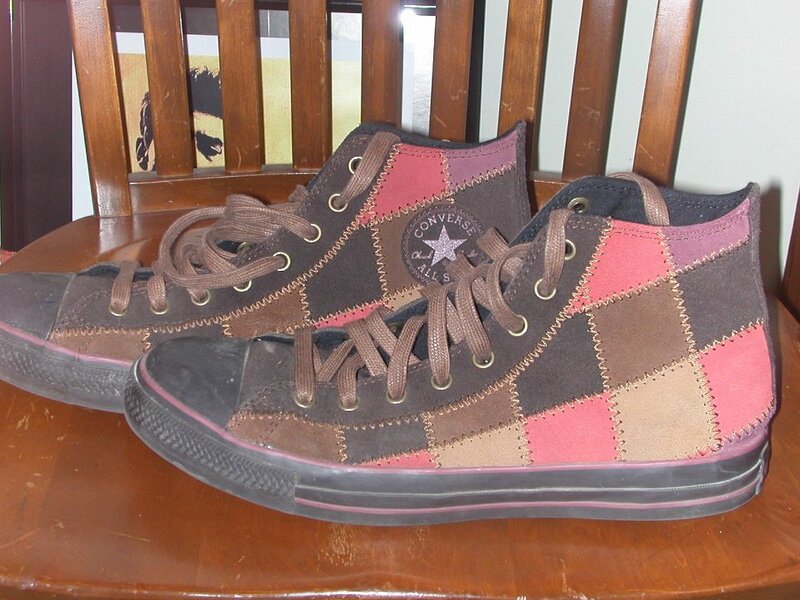 34 Brad Deniston Collection of Chucks Angled side view of burlap low club chucks with maroon laces. 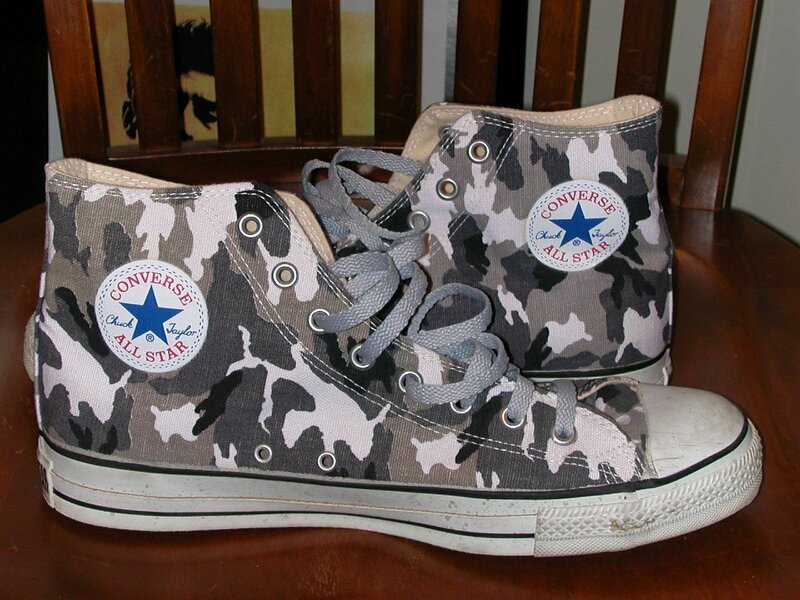 35 Brad Deniston Collection of Chucks Inside patch views of brown camouflage high tops. 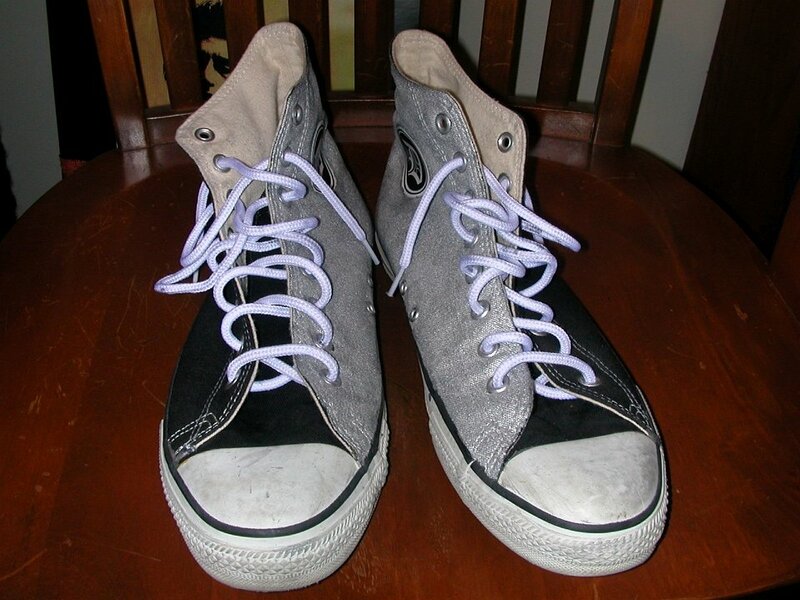 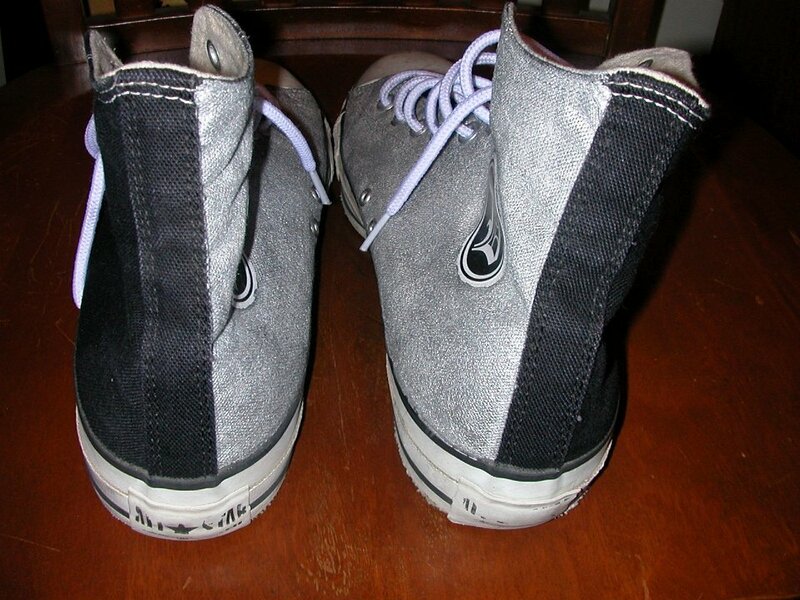 36 Brad Deniston Collection of Chucks Rear view of charcoal grey high tops with gray shoelaces. 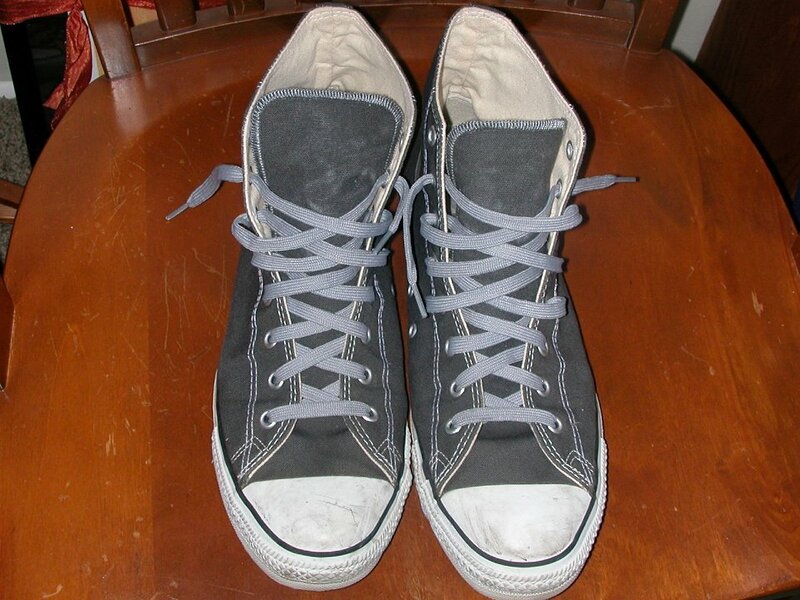 37 Brad Deniston Collection of Chucks Top view of charcoal grey high tops with gray shoelaces. 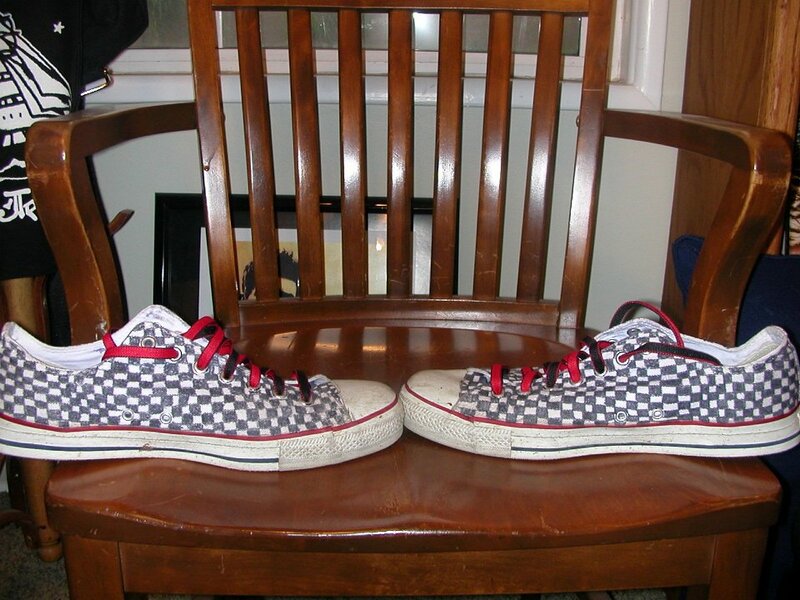 38 Brad Deniston Collection of Chucks Angled side view of grey checkered print high tops with red trim and laces. 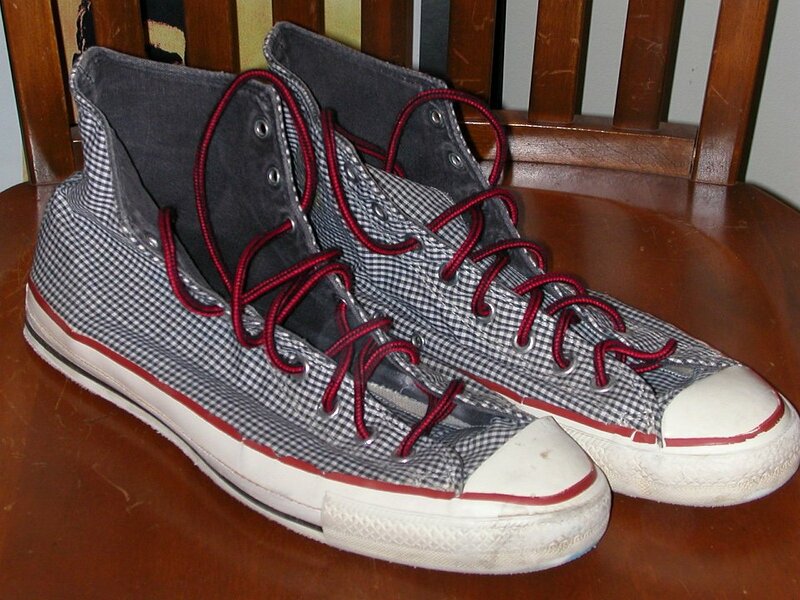 39 Brad Deniston Collection of Chucks Side views of black and white checkered low cut chucks. 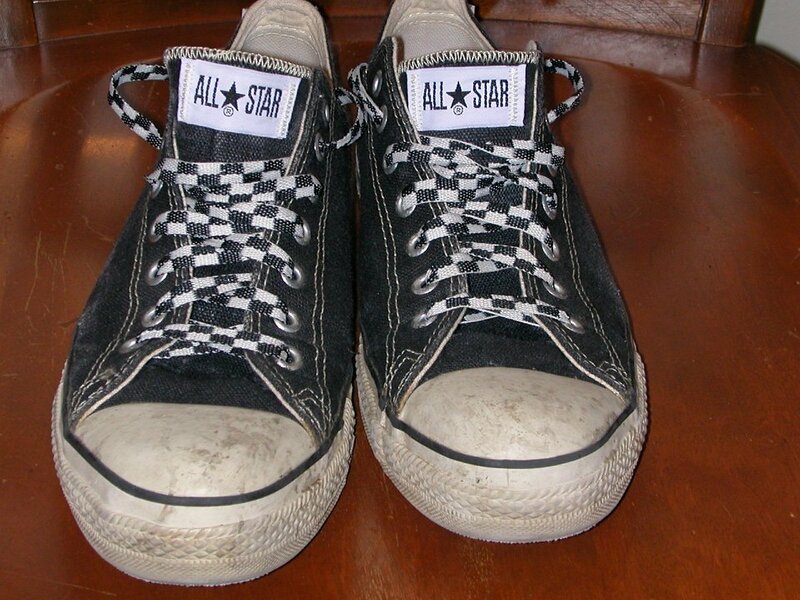 40 Brad Deniston Collection of Chucks Rear view of black and white checkered low cut chucks. 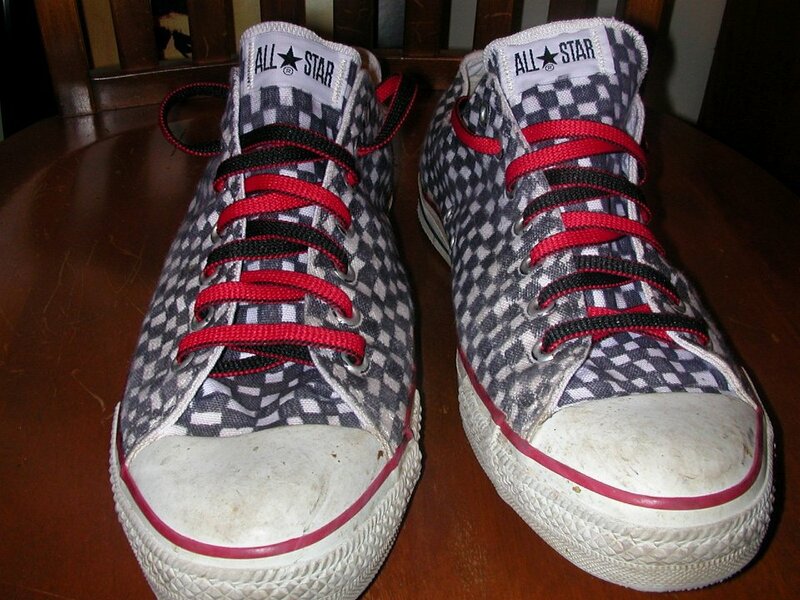 41 Brad Deniston Collection of Chucks Front view of black and white checkered low cut chucks with red and black reversible laces. 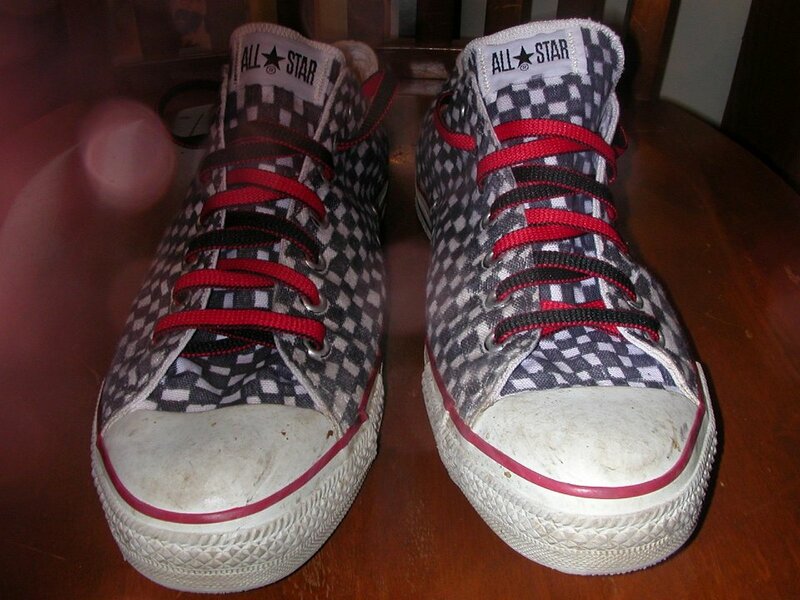 42 Brad Deniston Collection of Chucks Front view of black and white checkered low cut chucks with red and black reversible laces. 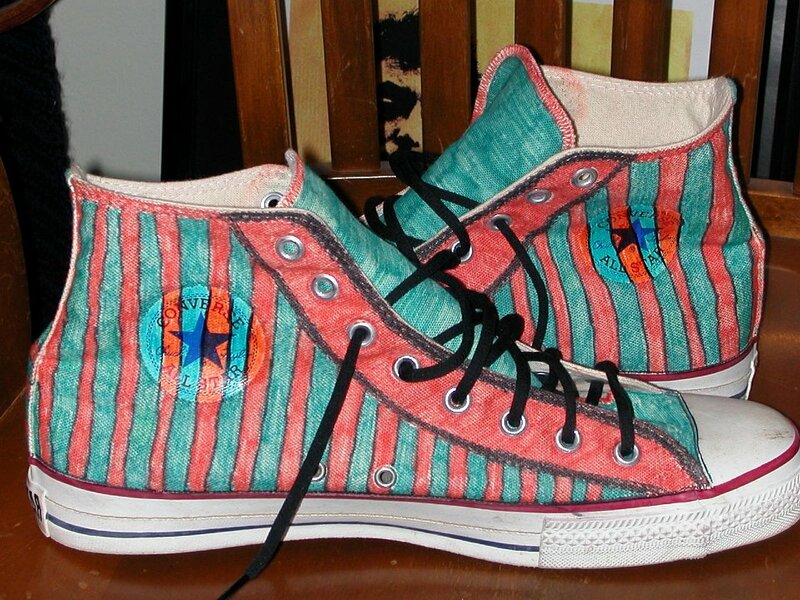 50 Brad Deniston Collection of Chucks Inside patch views of painted Cinco de Mayo high tops. 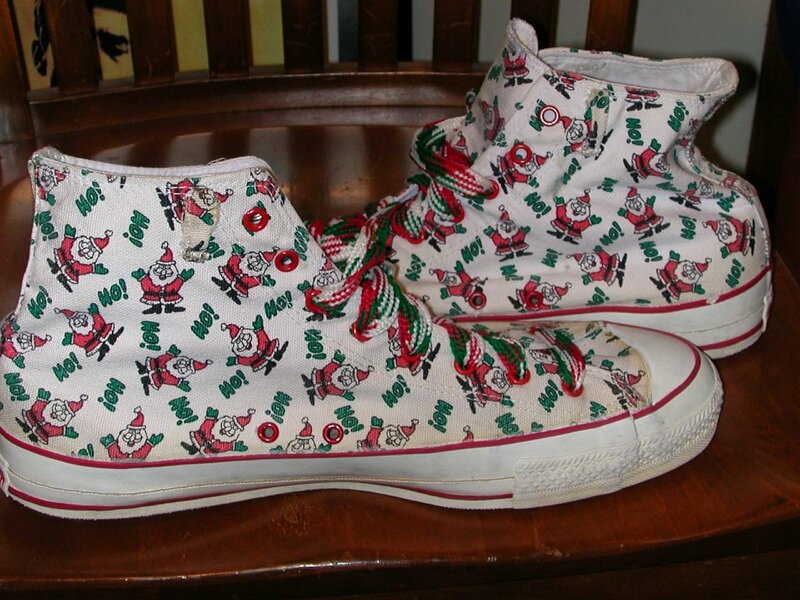 51 Brad Deniston Collection of Chucks Angled side view of comic print high tops with red shoelaces. 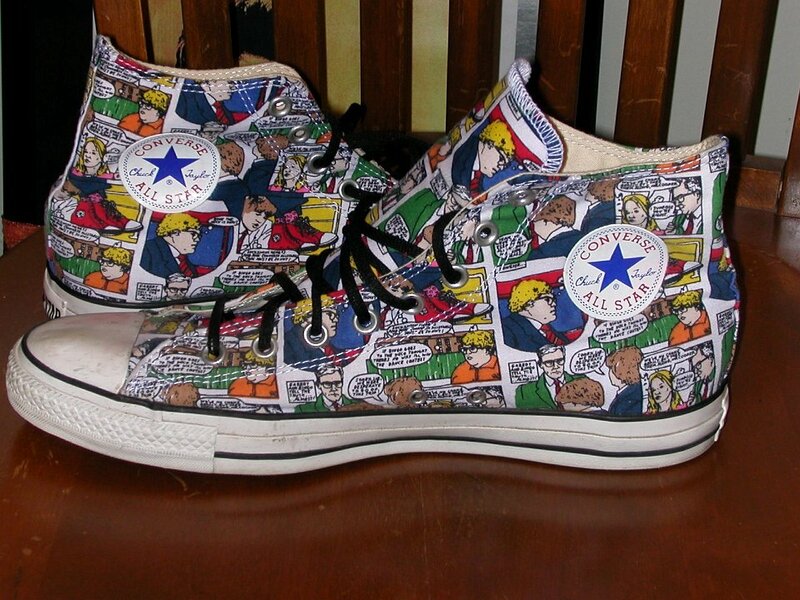 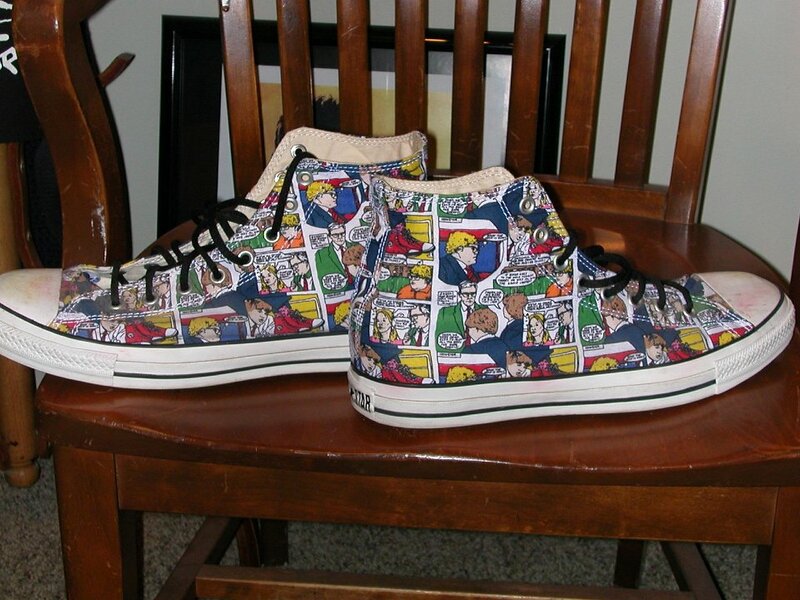 52 Brad Deniston Collection of Chucks Rear view of comic print high tops with red shoelaces. 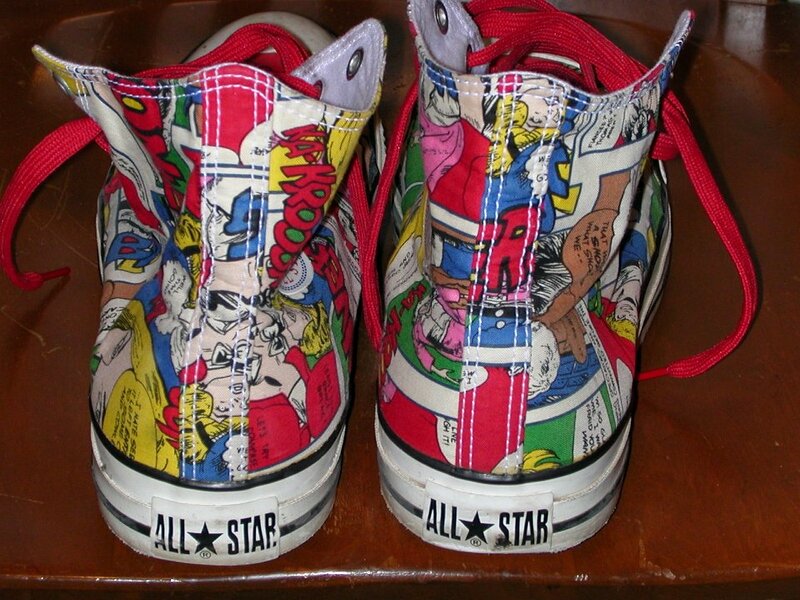 53 Brad Deniston Collection of Chucks Inside patch views of comic print high tops with red shoelaces. 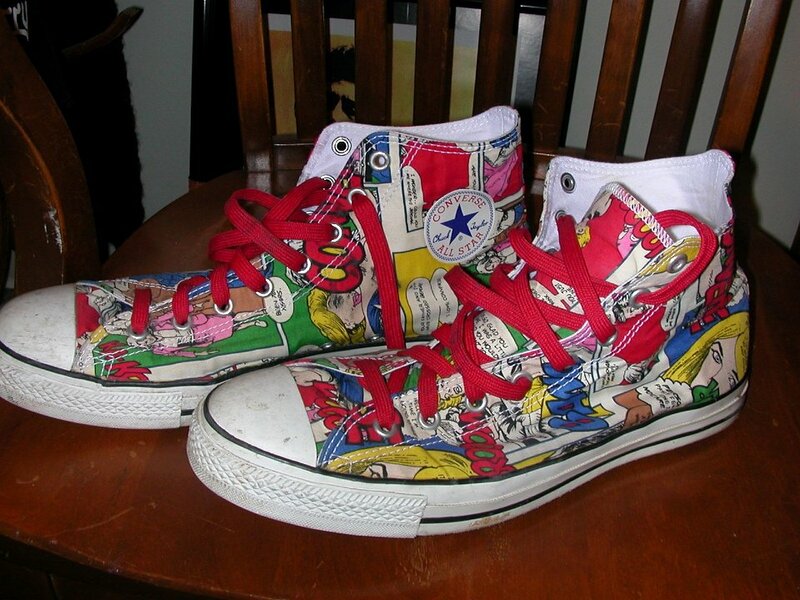 54 Brad Deniston Collection of Chucks Outside views of comic print high tops with red shoelaces. 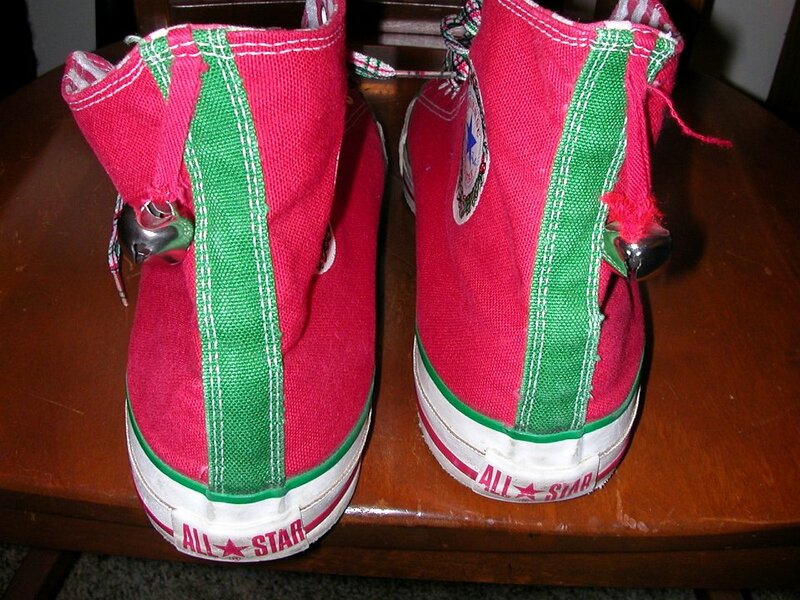 55 Brad Deniston Collection of Chucks Rear view of custom made tricolor high tops. 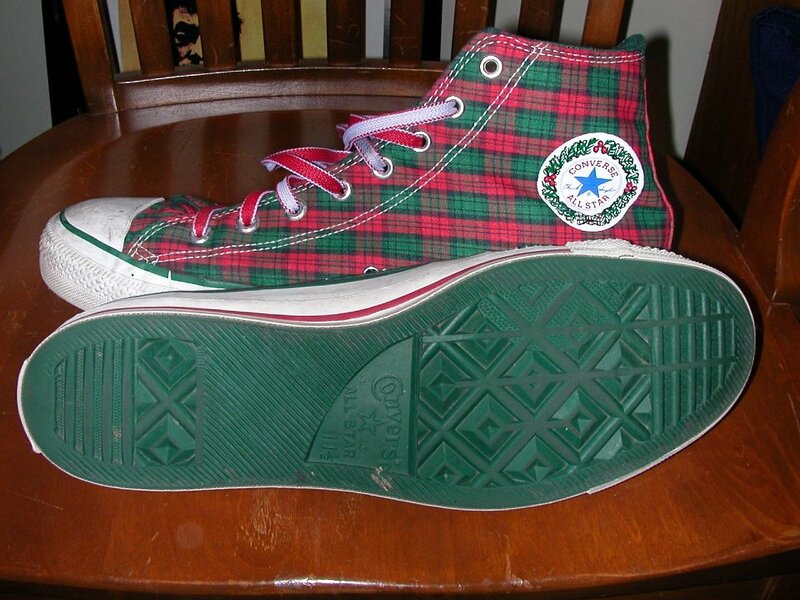 56 Brad Deniston Collection of Chucks Front view of custom made tricolor high tops. 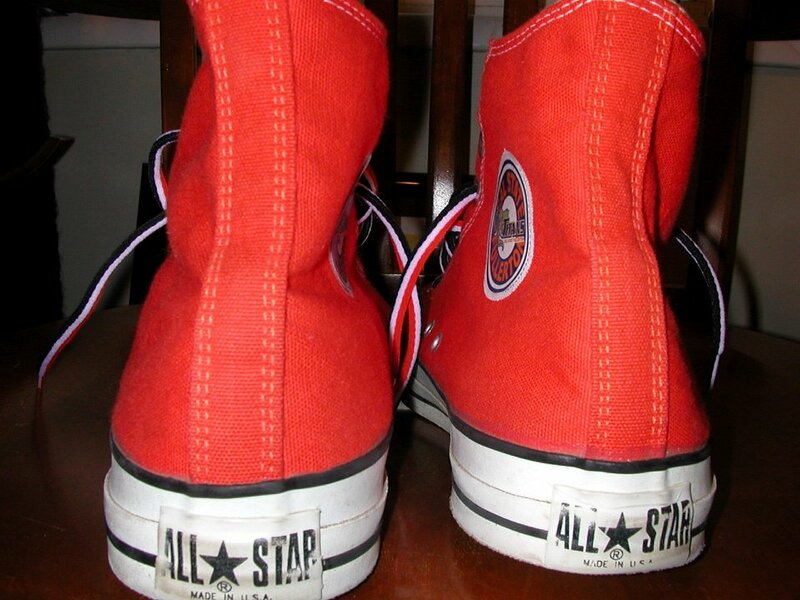 60 Brad Deniston Collection of Chucks Rear view of red Fullerton College high tops. 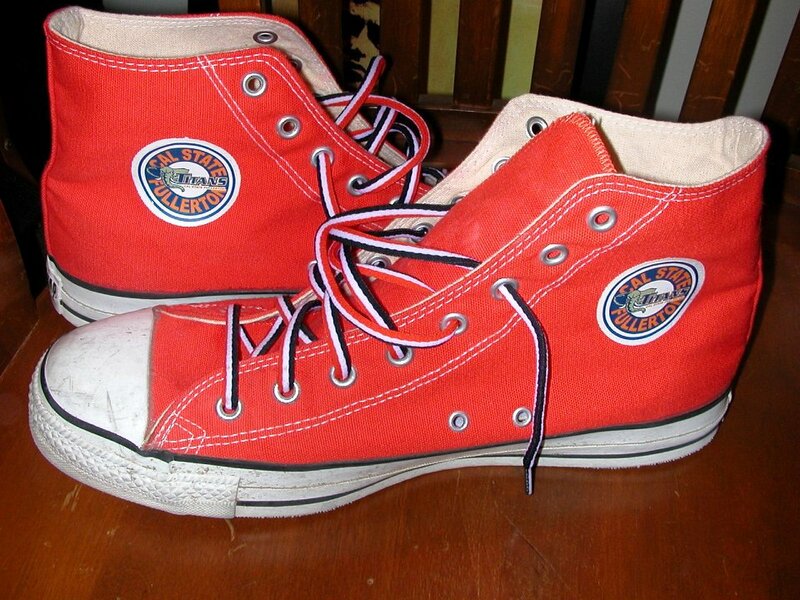 61 Brad Deniston Collection of Chucks inside patch views of red Fullerton College high tops. 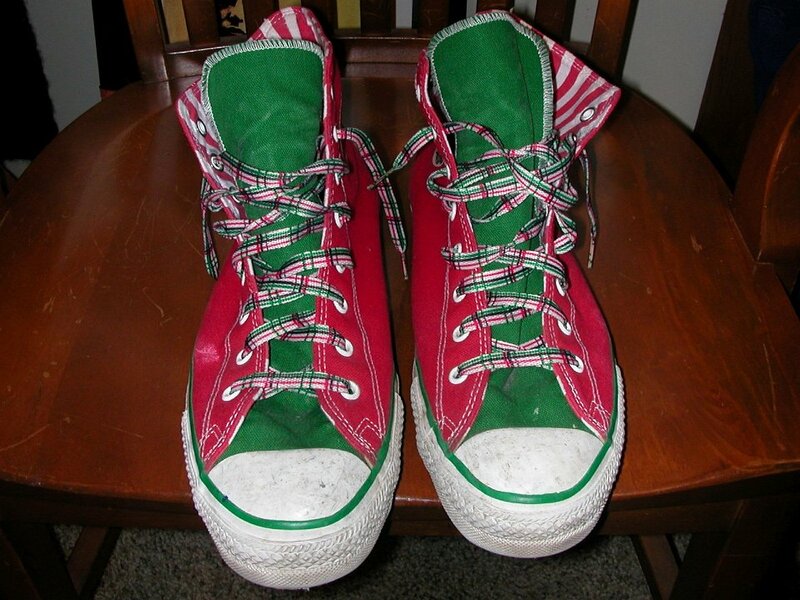 62 Brad Deniston Collection of Chucks Front view of red Fullerton College high tops. 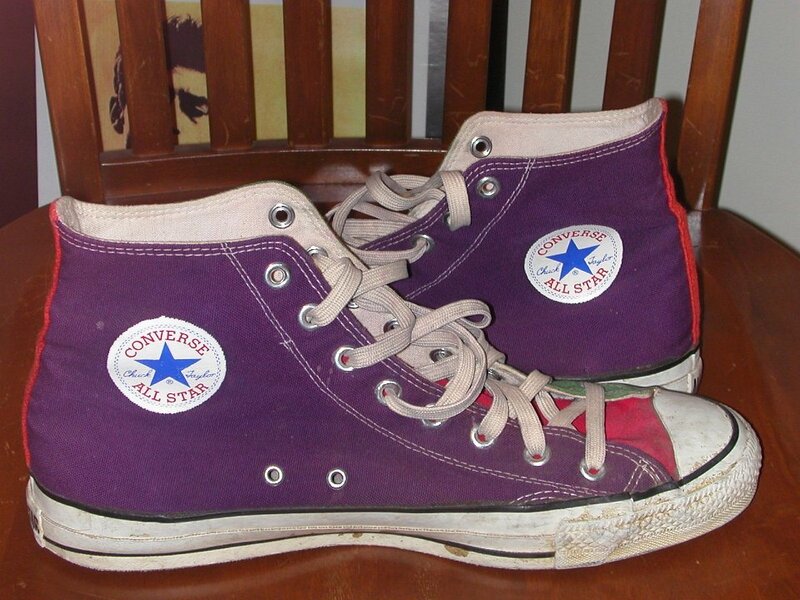 63 Brad Deniston Collection of Chucks inside patch views of black Fullerton College high tops. 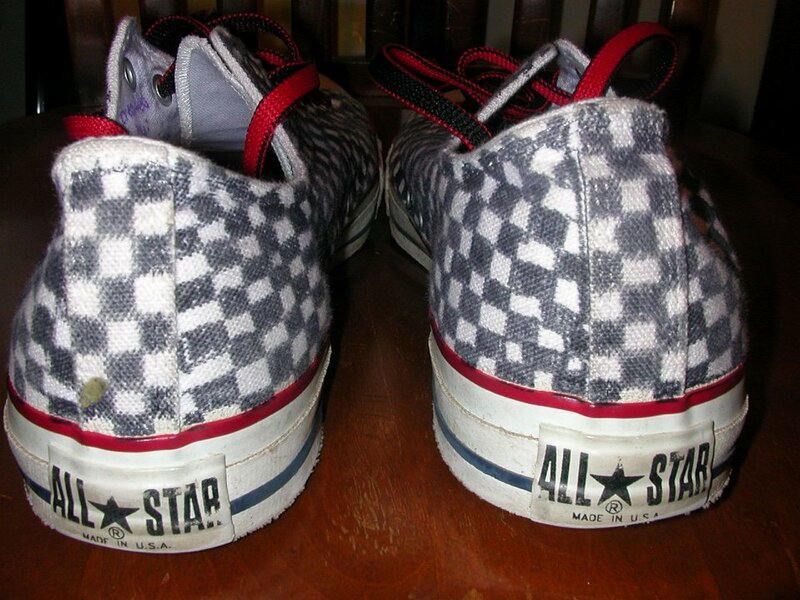 64 Brad Deniston Collection of Chucks Top view of gold low cut chucks with black and white checkered laces. 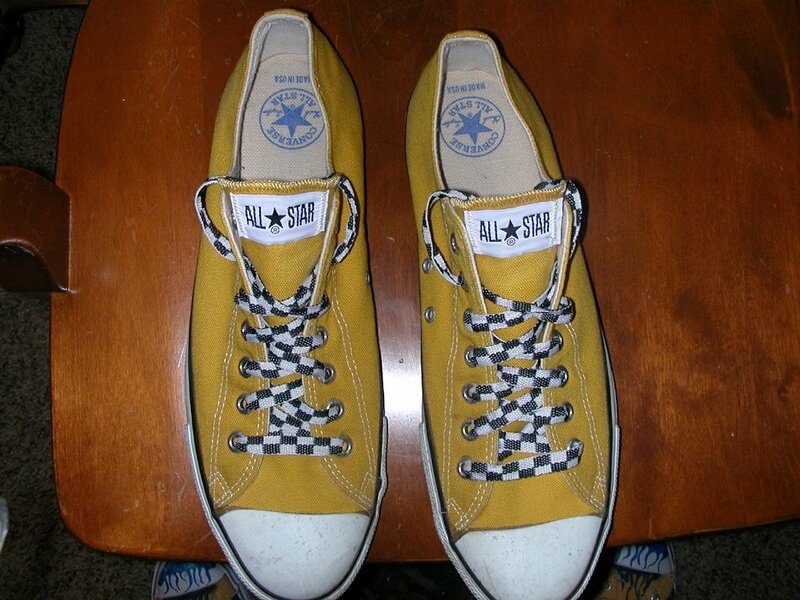 65 Brad Deniston Collection of Chucks Top view of gold low cut chucks with black and white checkered laces. 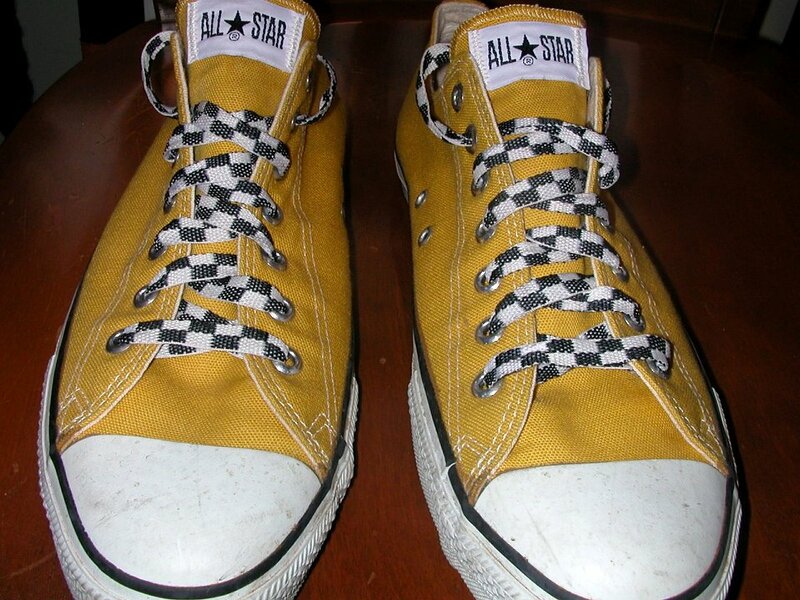 66 Brad Deniston Collection of Chucks Rear view of gold low cut chucks with black and white checkered laces. 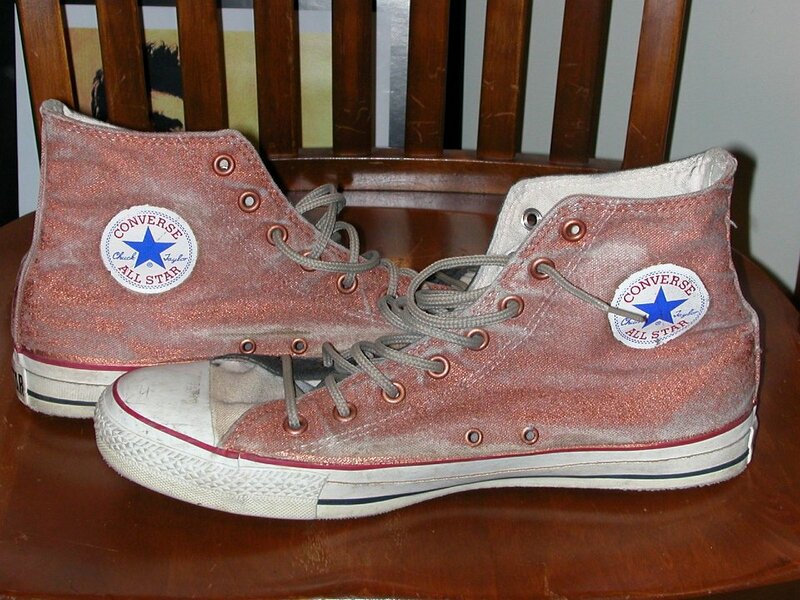 67 Brad Deniston Collection of Chucks Inside patch views of grafitti high tops. 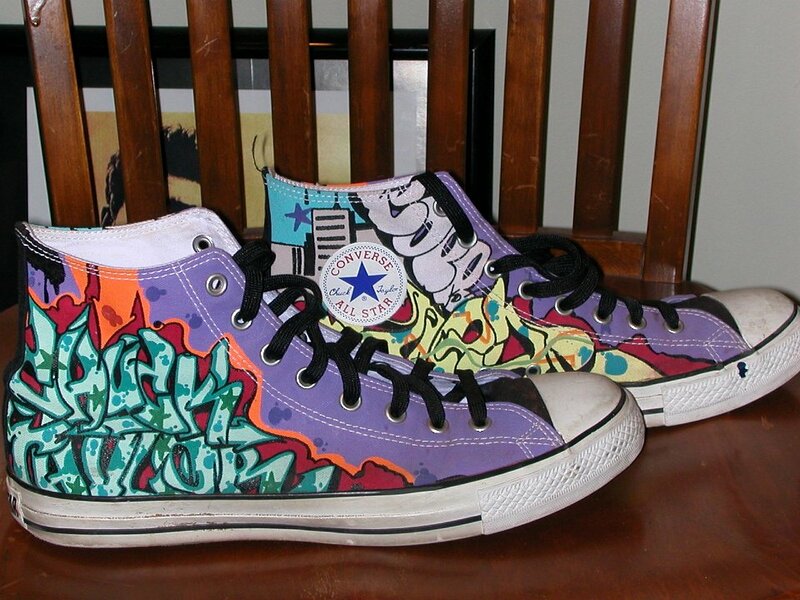 68 Brad Deniston Collection of Chucks Rear view of grafitti high tops. 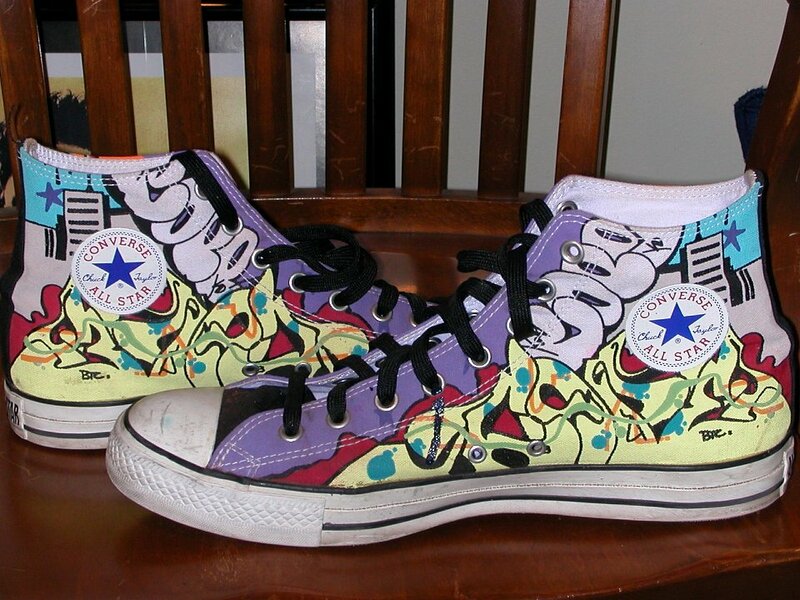 69 Brad Deniston Collection of Chucks Right side views of grafitti high tops. 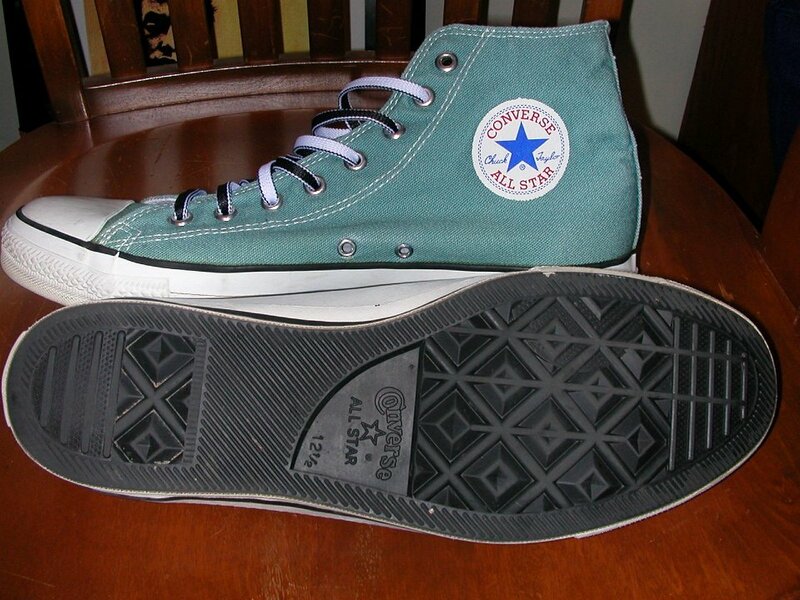 70 Brad Deniston Collection of Chucks Inside patch view of green retro high tops. 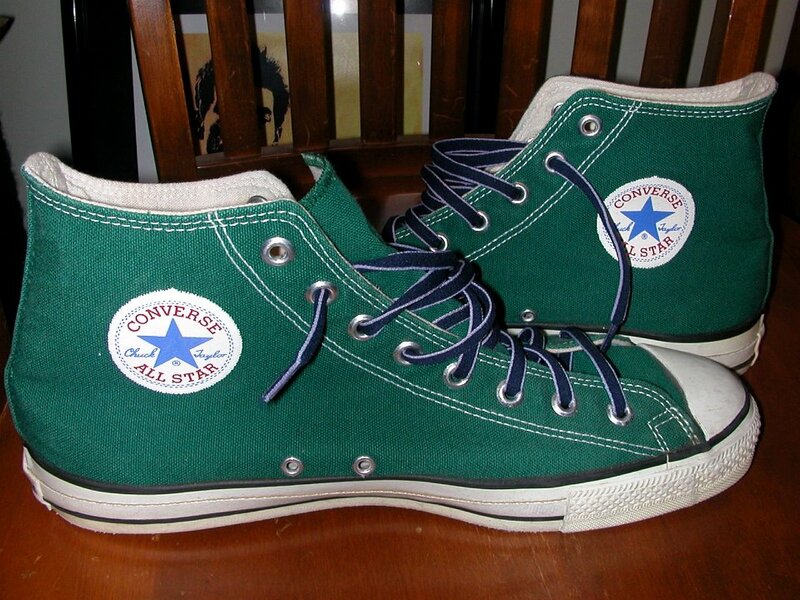 71 Brad Deniston Collection of Chucks Front view of green retro high tops. 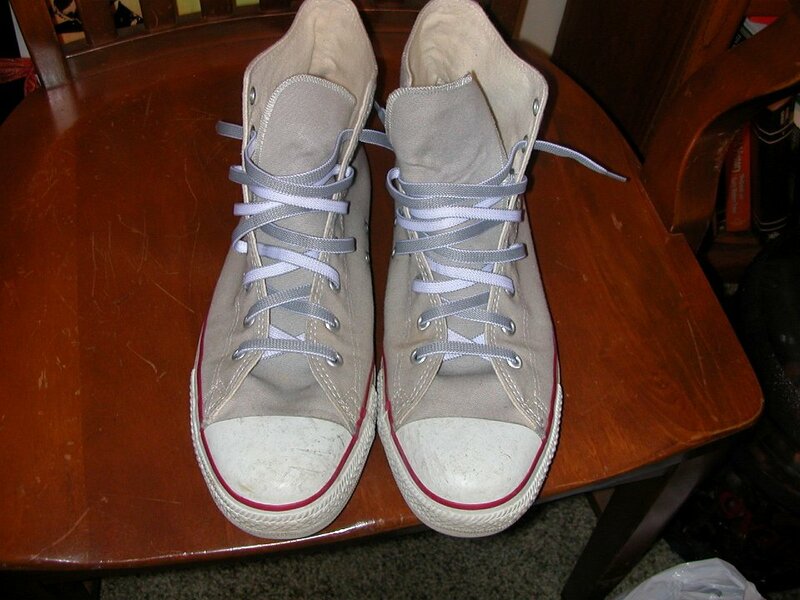 72 Brad Deniston Collection of Chucks Top view of vintage gray high tops. 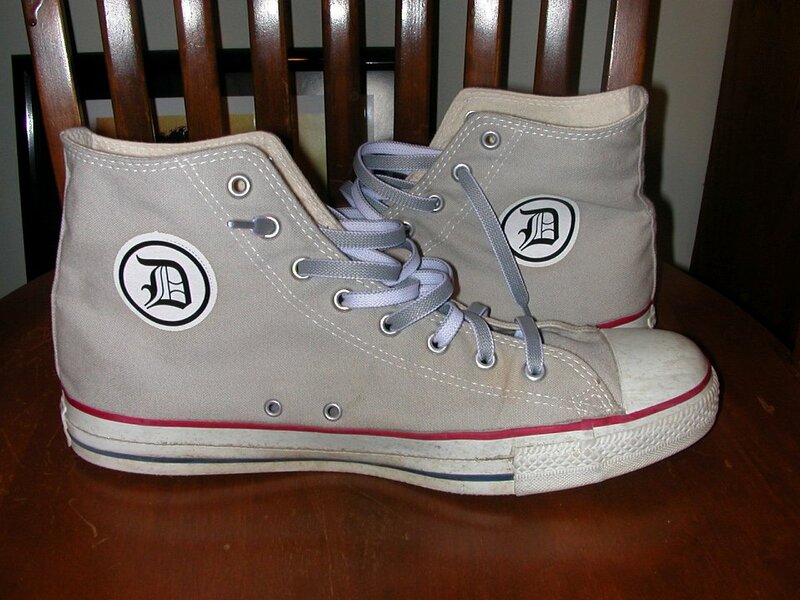 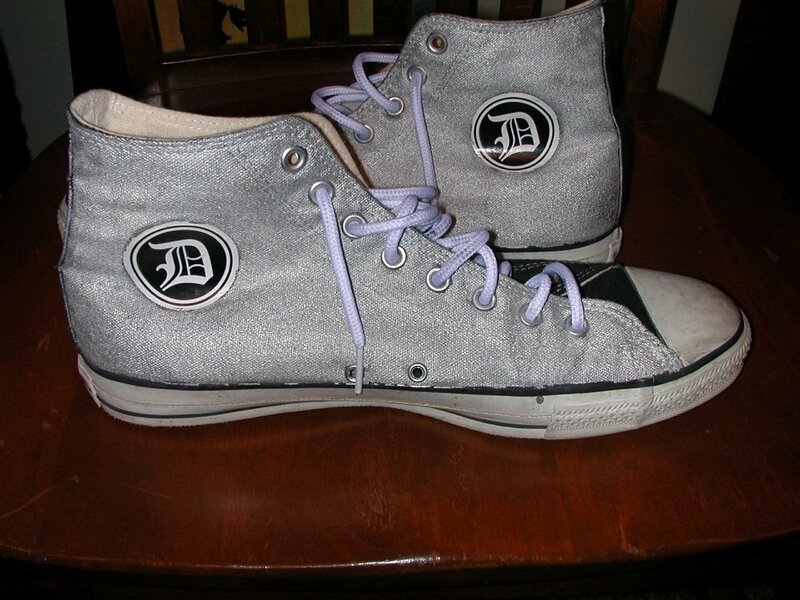 73 Brad Deniston Collection of Chucks Inside patch views of vintage gray Detroit high tops. 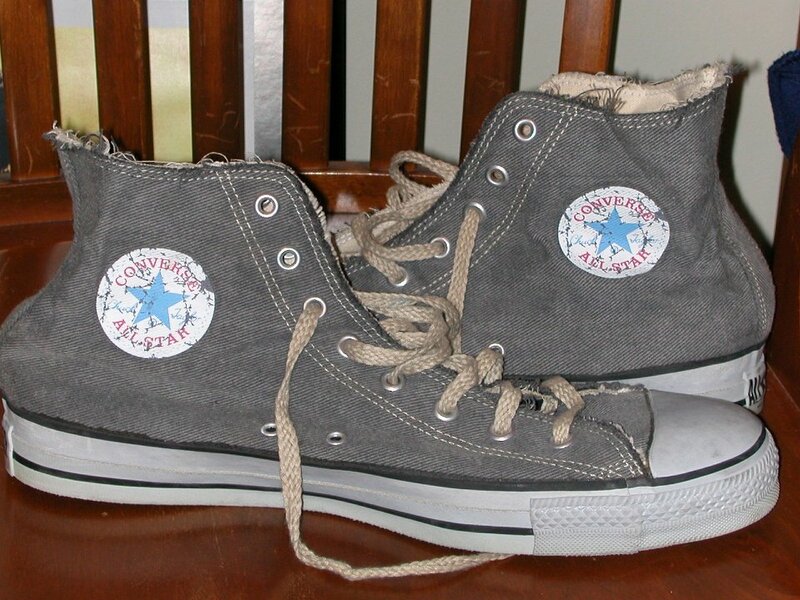 74 Brad Deniston Collection of Chucks Rear view of vintage gray high tops. 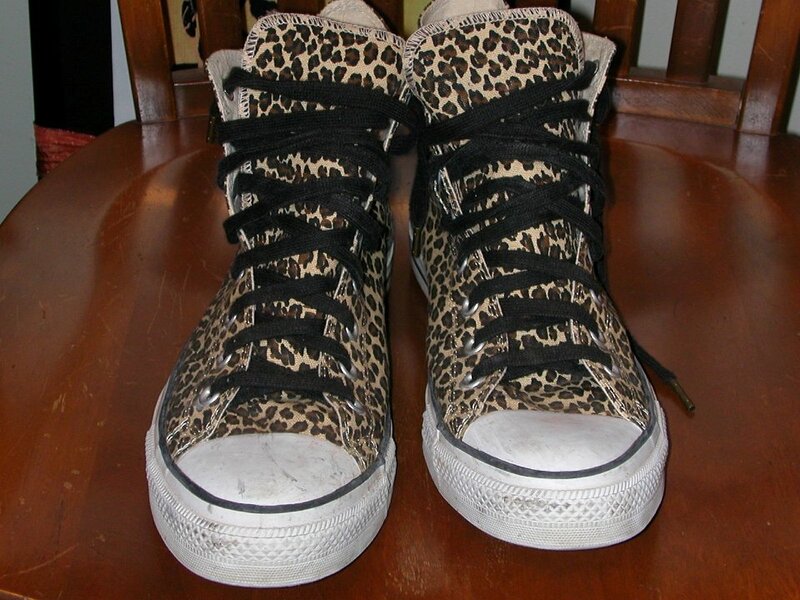 75 Brad Deniston Collection of Chucks Front view of leopard print high tops. 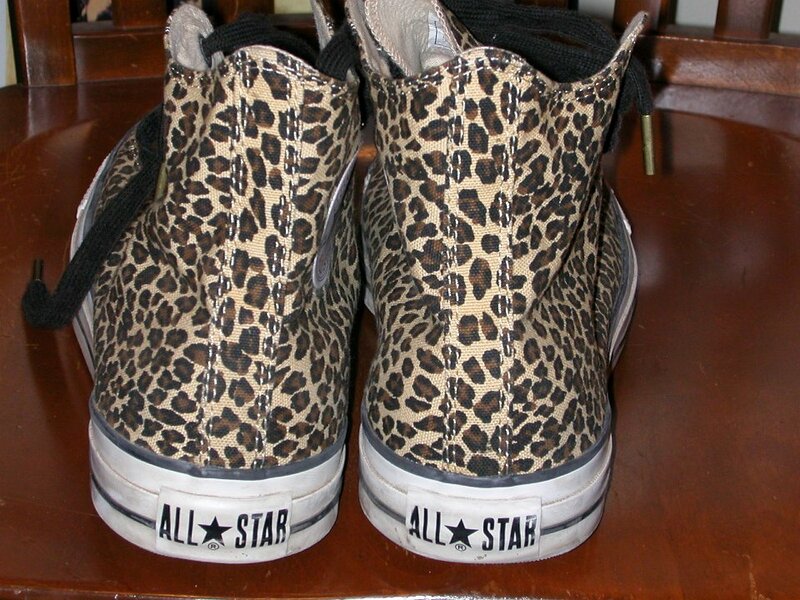 76 Brad Deniston Collection of Chucks Rear view of leopard print high tops. 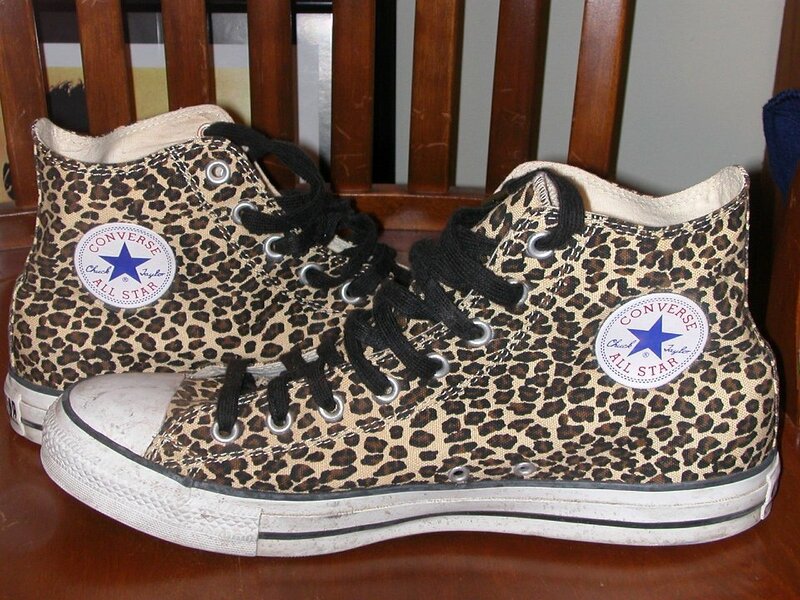 77 Brad Deniston Collection of Chucks inside patch views of leopard print high tops. 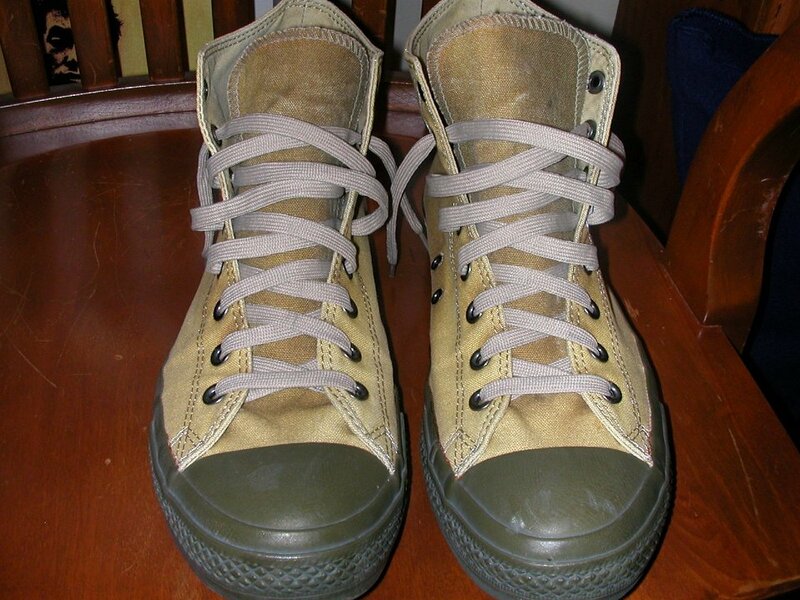 78 Brad Deniston Collection of Chucks Inside patch and sole views of green high top chucks. 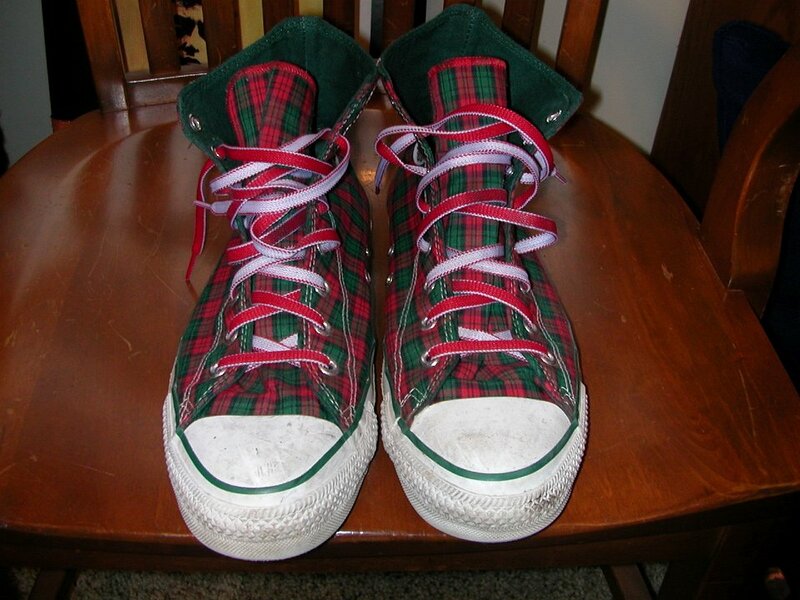 79 Brad Deniston Collection of Chucks Rear view of green high top chucks. 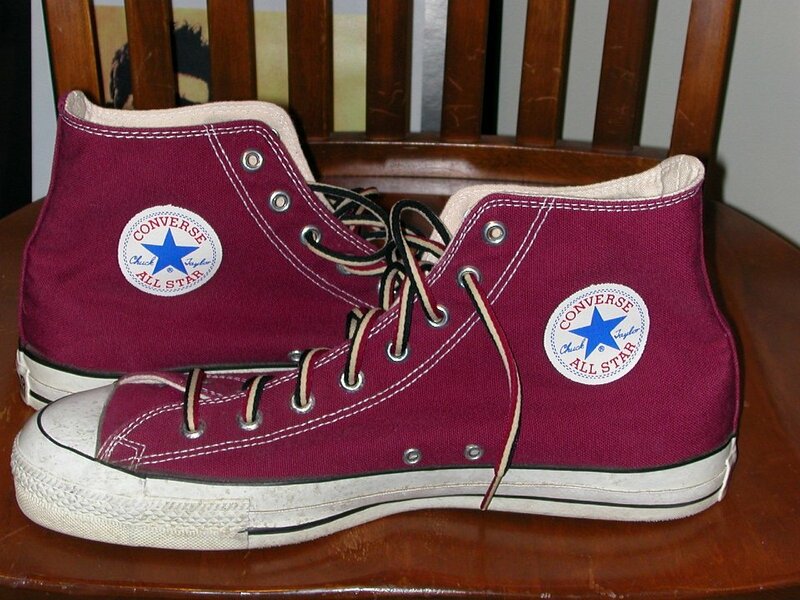 80 Brad Deniston Collection of Chucks Inside patch views of maroon high tops. 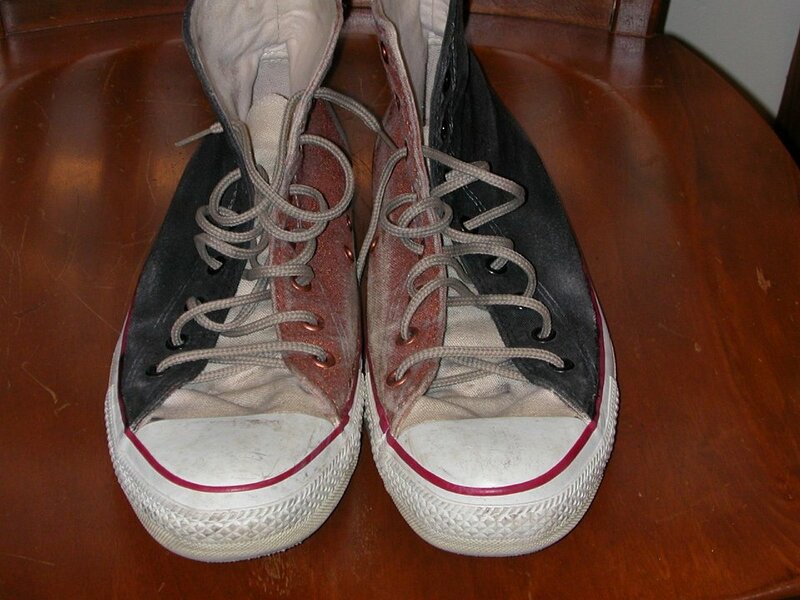 81 Brad Deniston Collection of Chucks Inside patch and front views of monochrome black high tops. 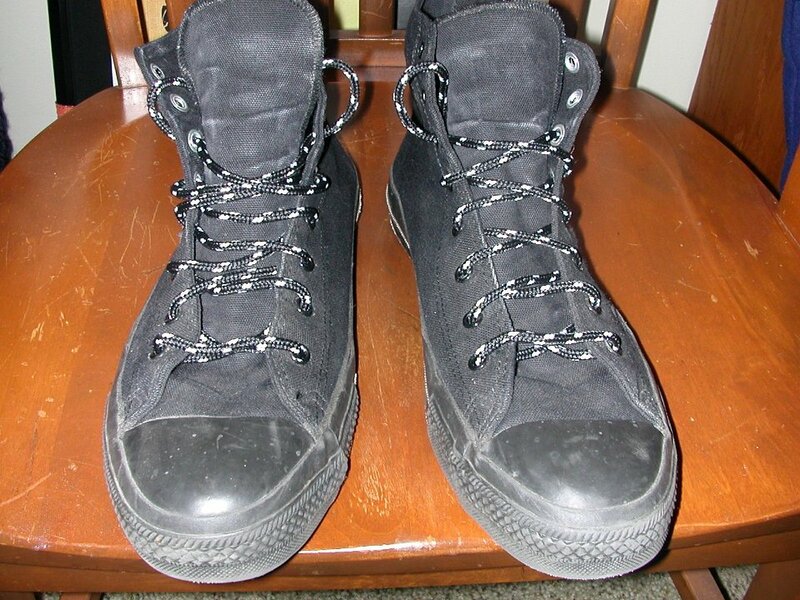 82 Brad Deniston Collection of Chucks Front view of monochrome black high top chucks. 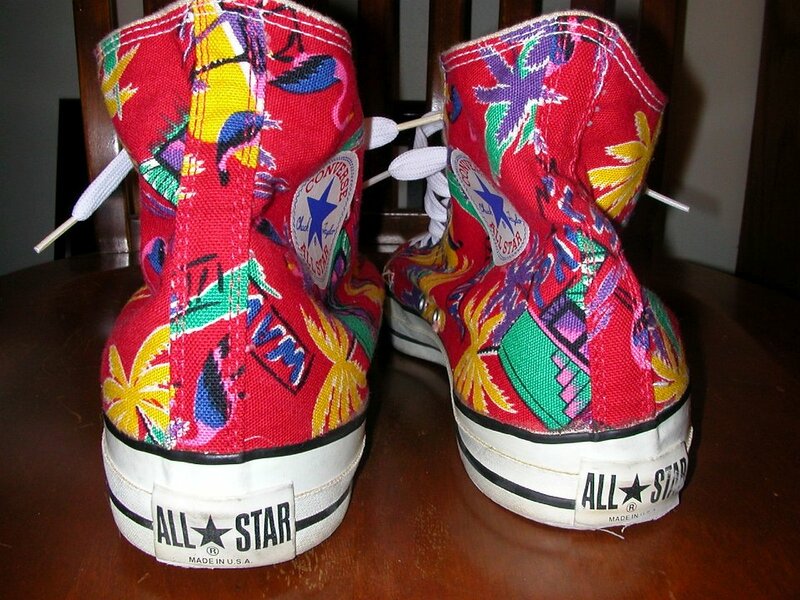 83 Brad Deniston Collection of Chucks Rear view of painted high top chucks. 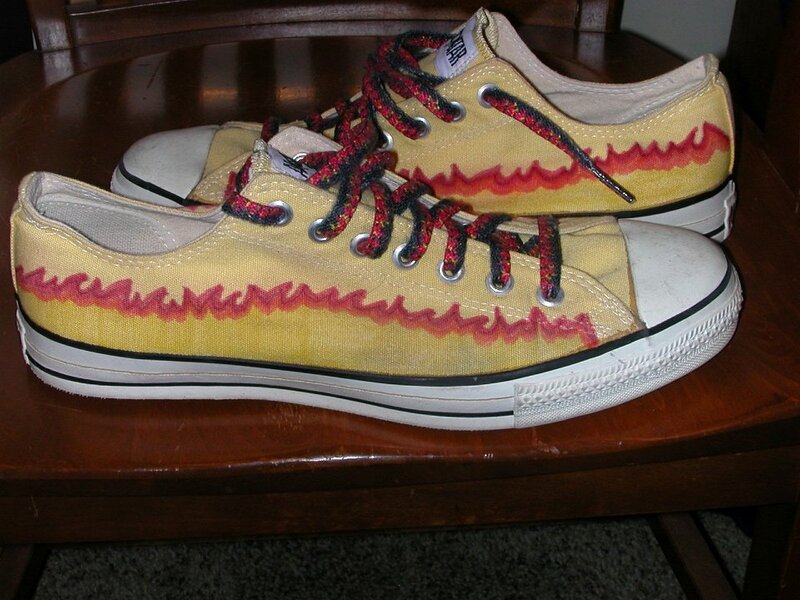 84 Brad Deniston Collection of Chucks Inside patch views of painted high top chucks. 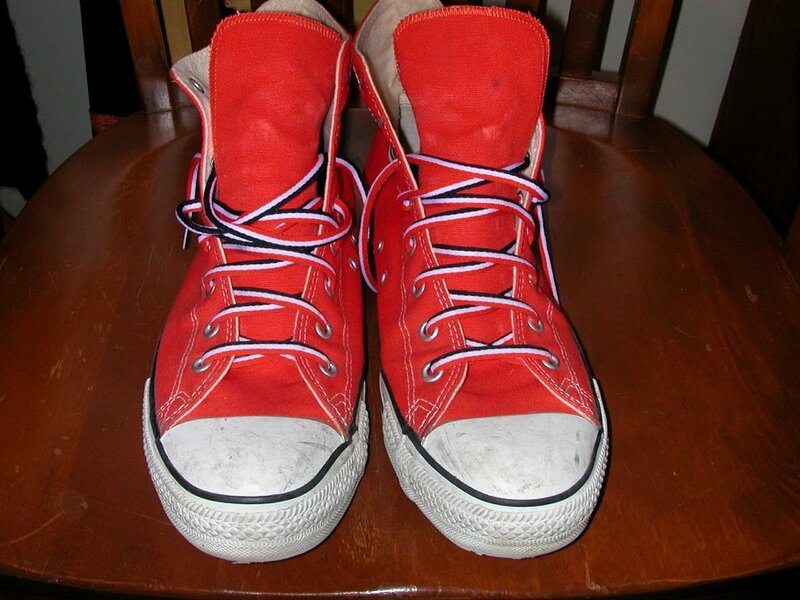 85 Brad Deniston Collection of Chucks Rear view of painted red high top chucks. 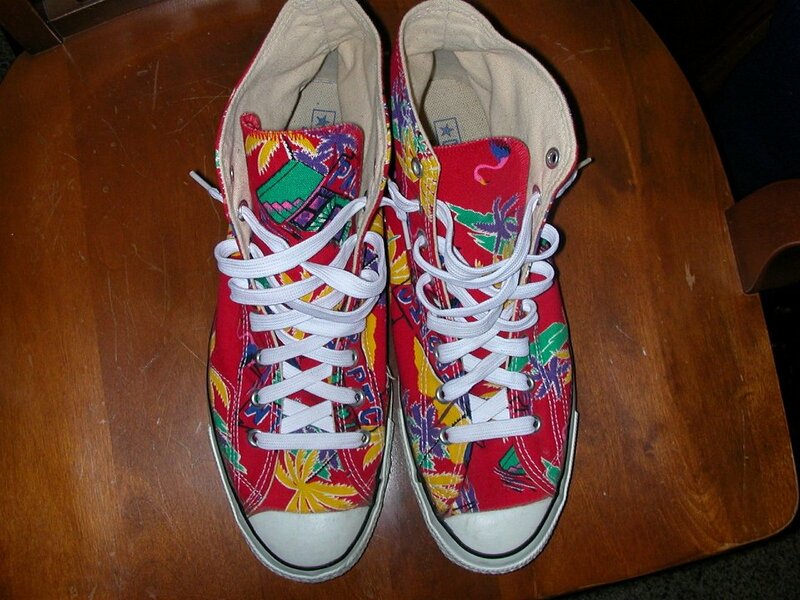 86 Brad Deniston Collection of Chucks Outside views of painted red high top chucks. 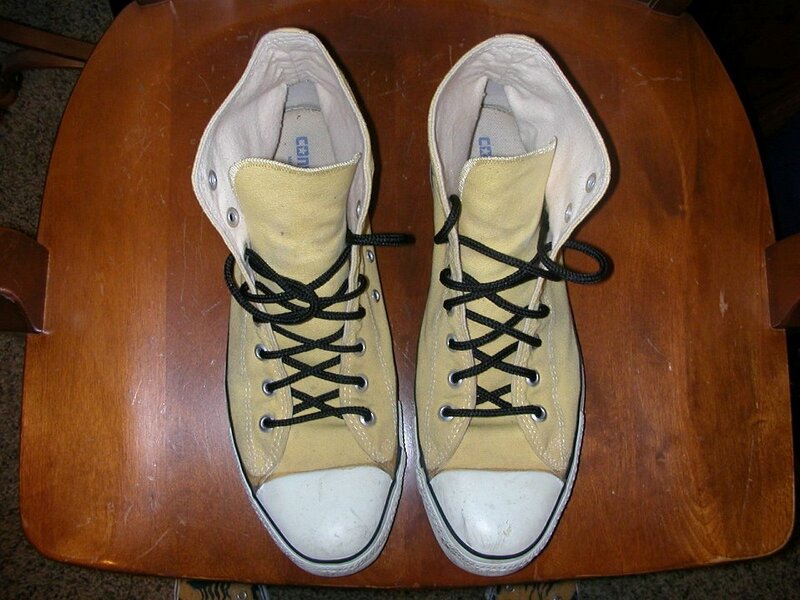 87 Brad Deniston Collection of Chucks Inside patch views of painted white high top chucks. 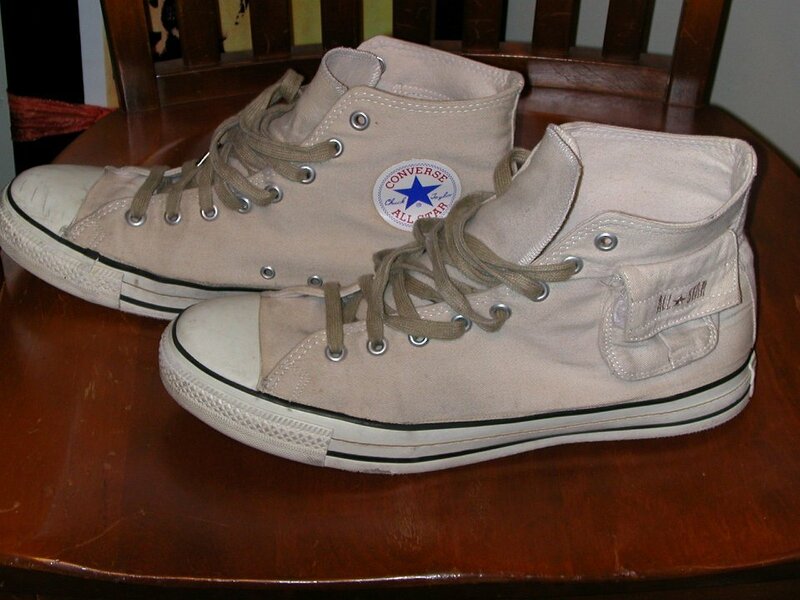 88 Brad Deniston Collection of Chucks Inside patch views of painted white high top chucks. 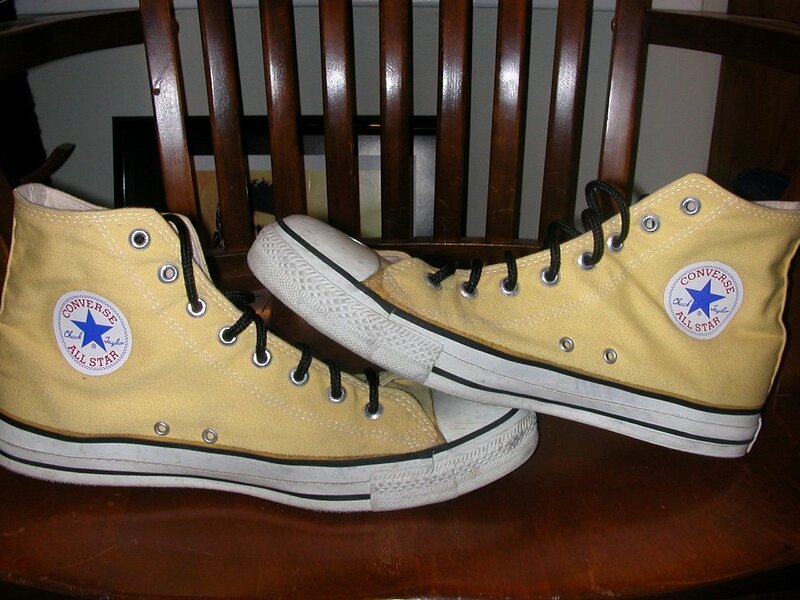 89 Brad Deniston Collection of Chucks Left side views of painted white high top chucks. 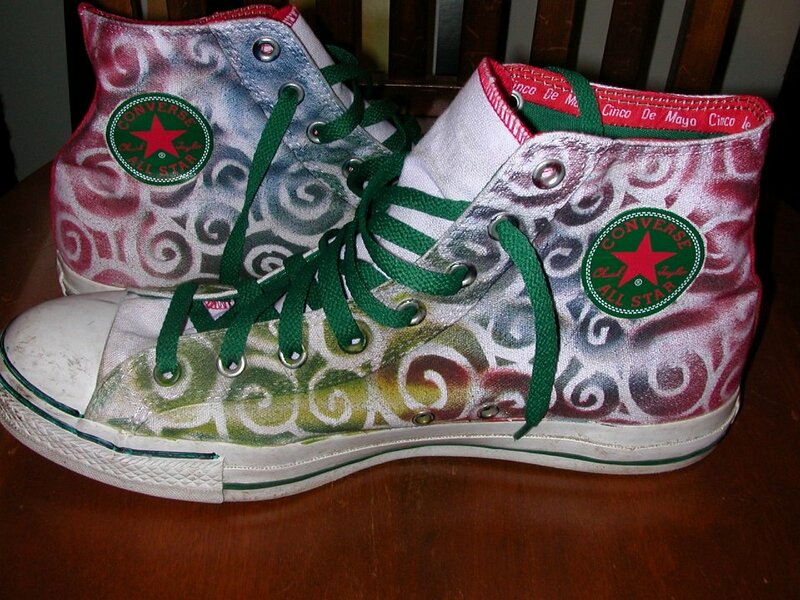 90 Brad Deniston Collection of Chucks Front view of painted high tops. 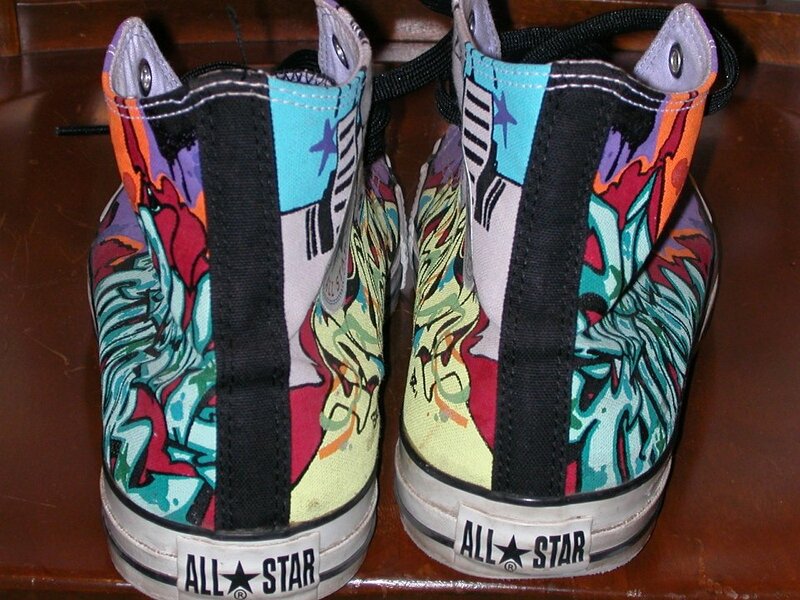 91 Brad Deniston Collection of Chucks Side view of painted high tops. 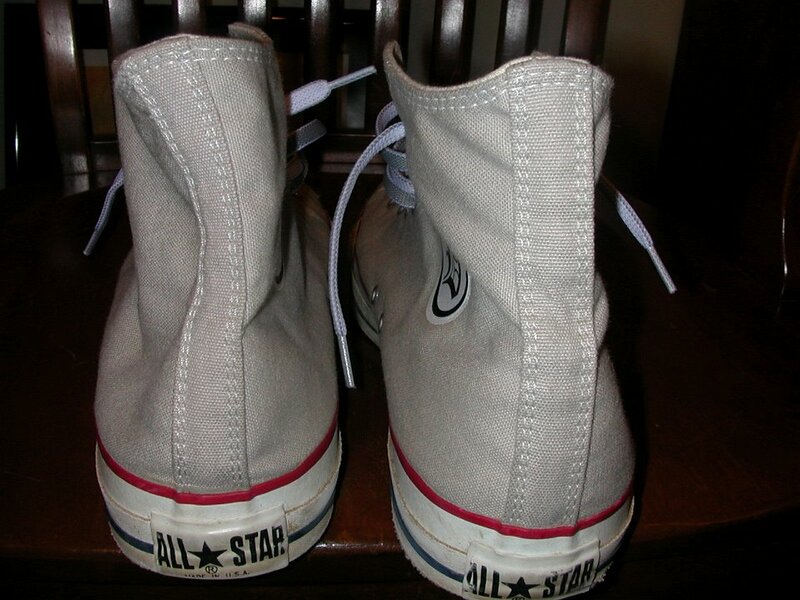 92 Brad Deniston Collection of Chucks Side view of painted low cuts. 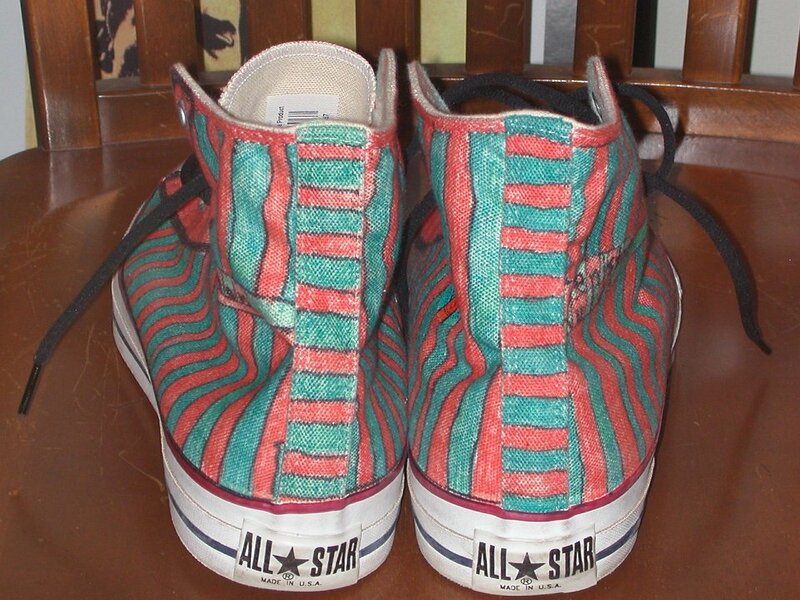 93 Brad Deniston Collection of Chucks Front view of painted low cuts. 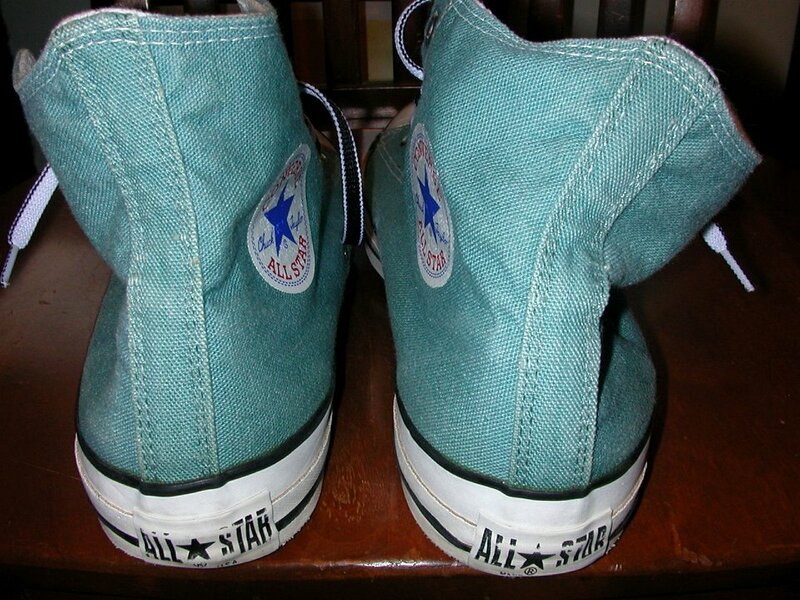 94 Brad Deniston Collection of Chucks Inside patch view of green high top chucks. 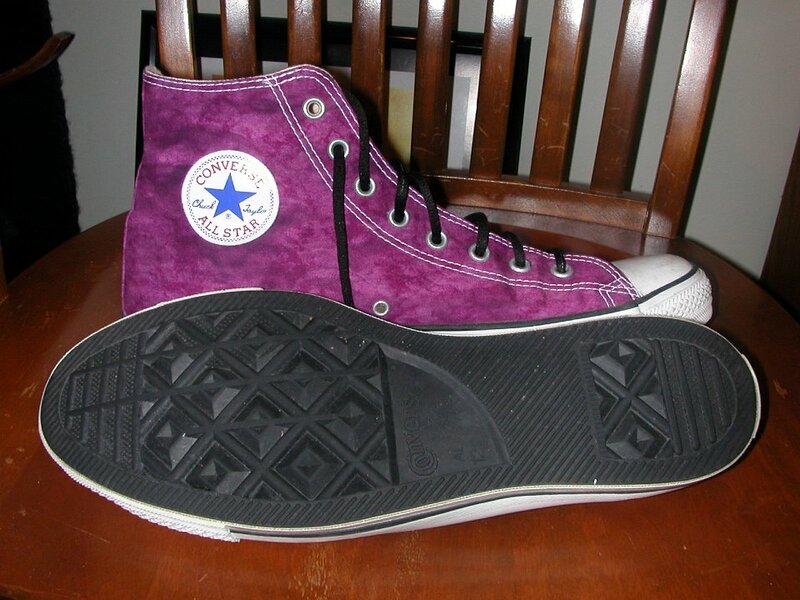 95 Brad Deniston Collection of Chucks Front view of purple Laker high tops. 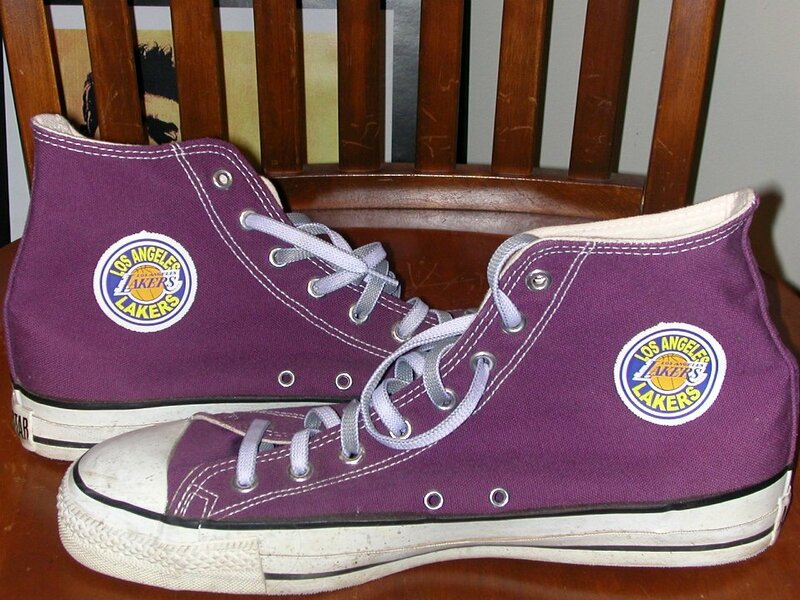 96 Brad Deniston Collection of Chucks Rear view of Laker purple high tops. 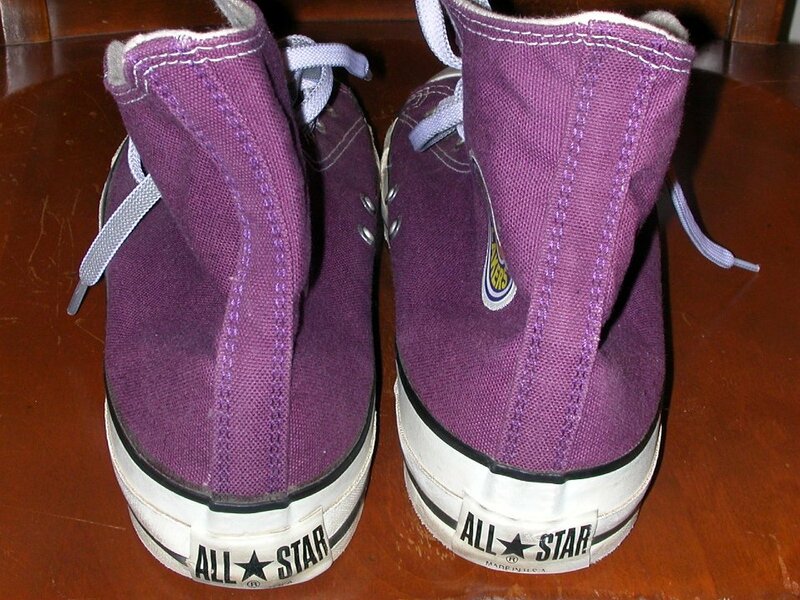 97 Brad Deniston Collection of Chucks Inside patch view of purple Laker high tops. 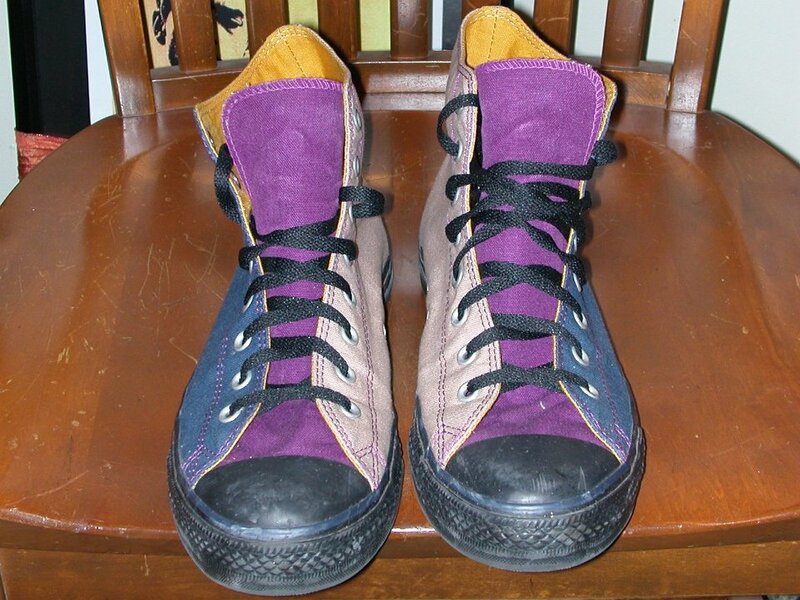 98 Brad Deniston Collection of Chucks Purple satin high tops, inside patch and sole views. 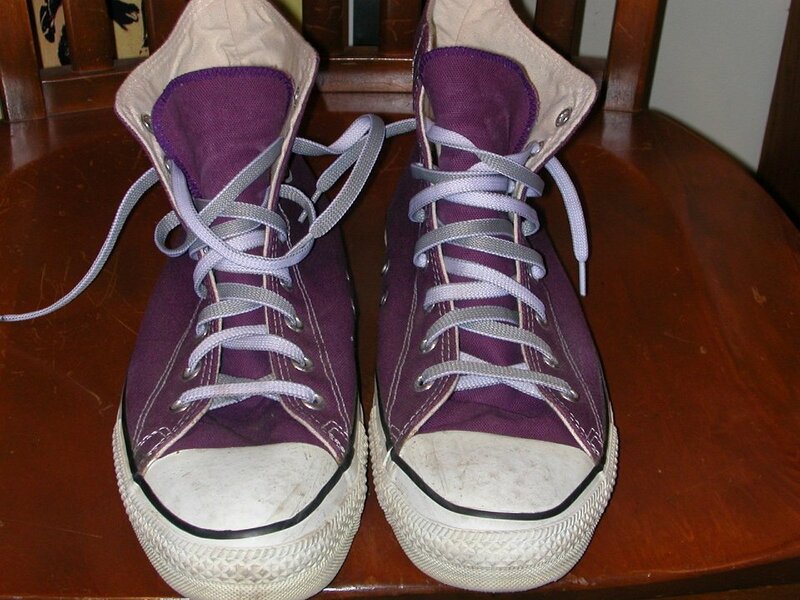 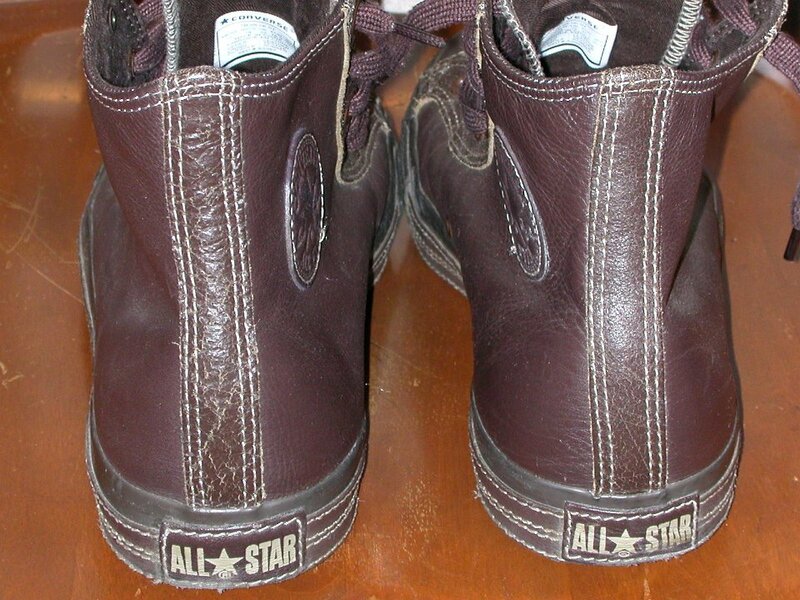 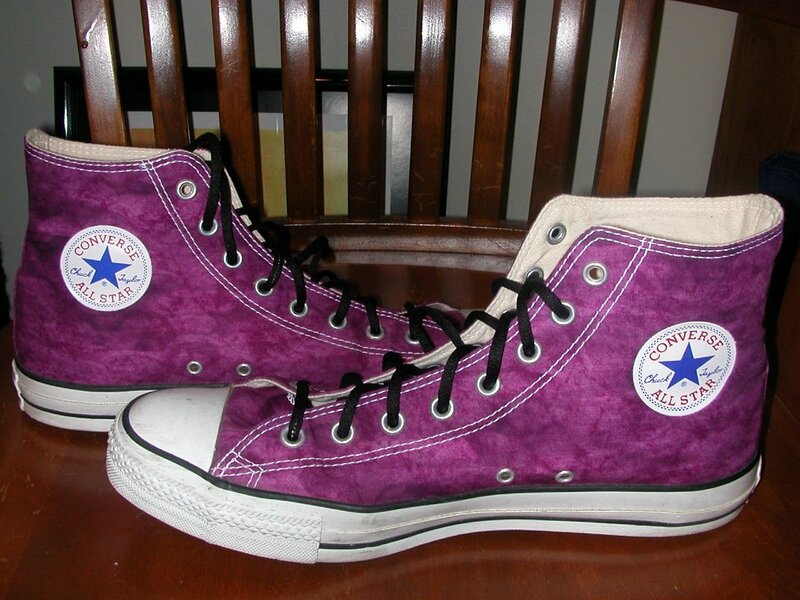 99 Brad Deniston Collection of Chucks Inside patch views of purple satin high top chucks. 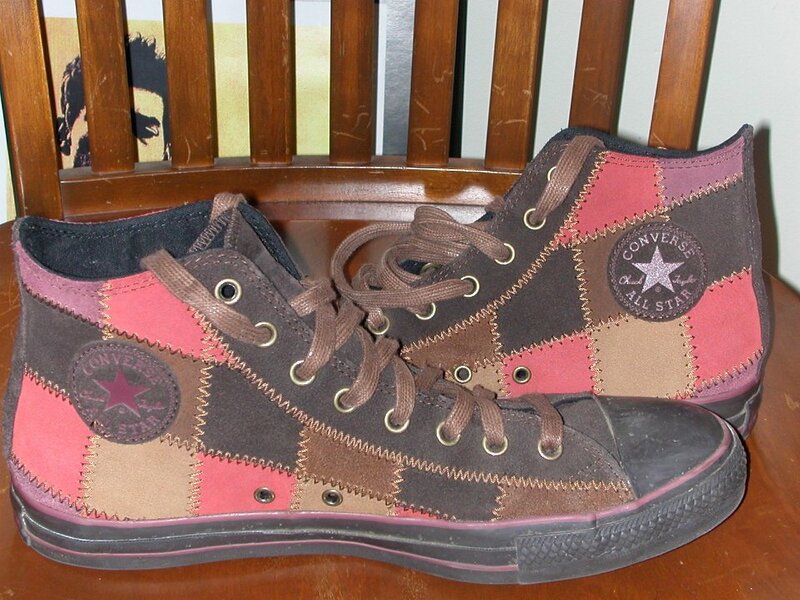 100 Brad Deniston Collection of Chucks Left side views of quilted high top chucks. 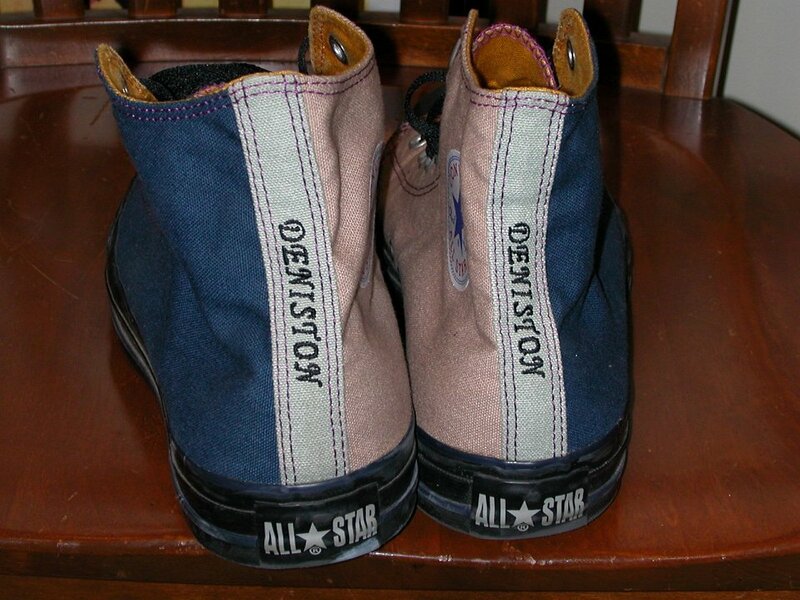 101 Brad Deniston Collection of Chucks Inside patch views of quilted high top chucks. 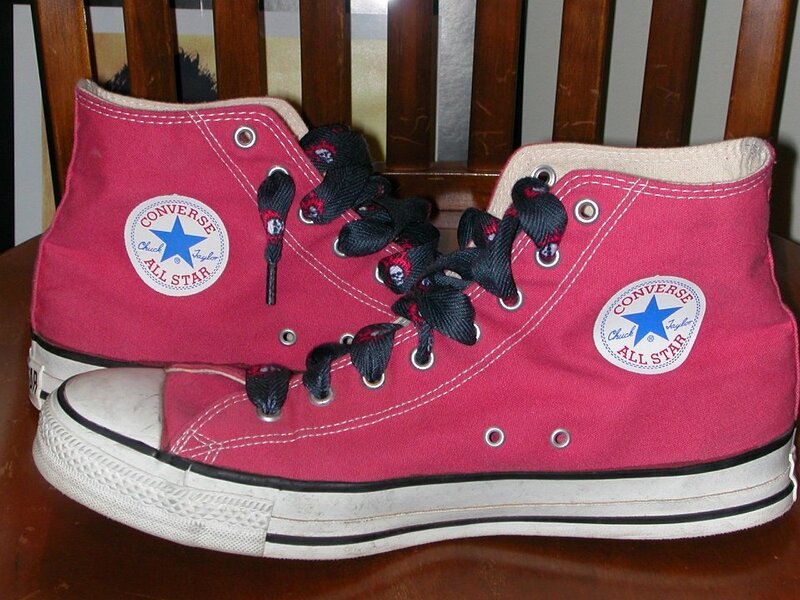 102 Brad Deniston Collection of Chucks Inside patch view of raspberry red high tops. 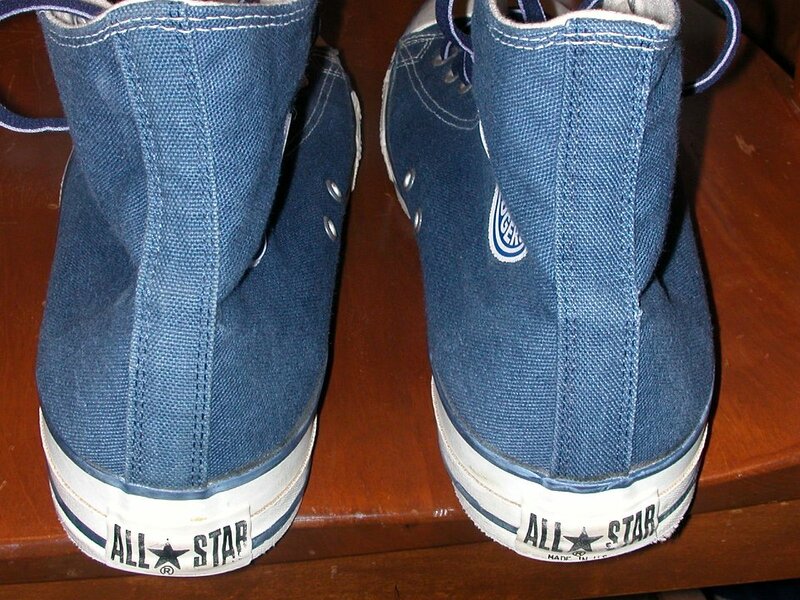 103 Brad Deniston Collection of Chucks Top view of royal blue low cut chucks. 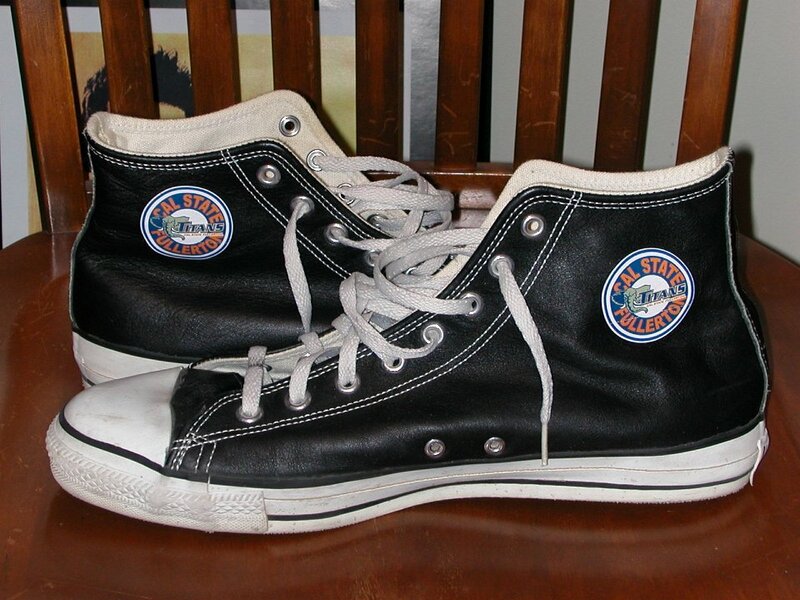 104 Brad Deniston Collection of Chucks Left side views of Sailor Jerry high top chucks. 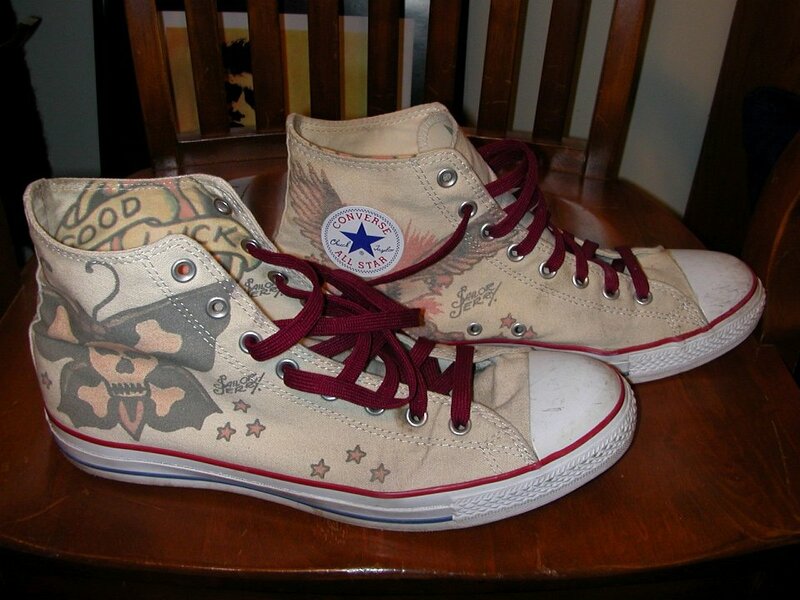 105 Brad Deniston Collection of Chucks Inside patch views of Sailor Jerry high top chucks. 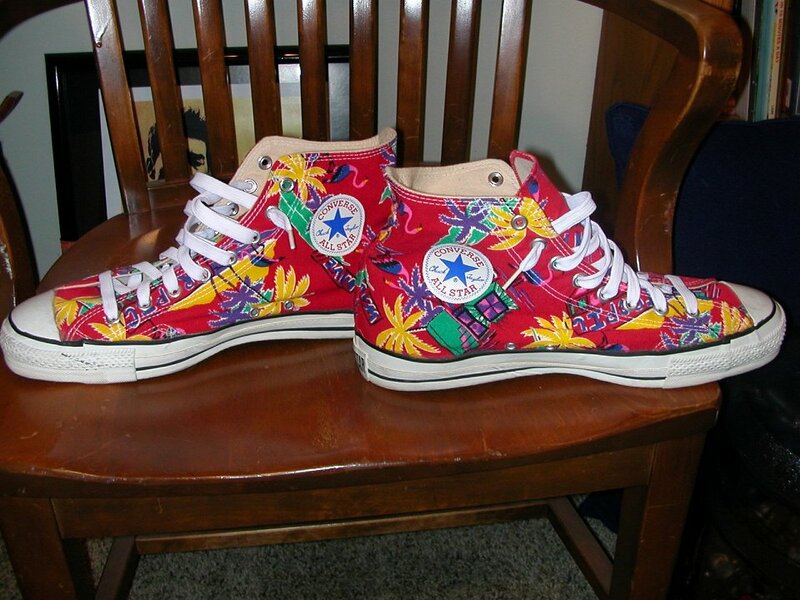 106 Brad Deniston Collection of Chucks Outside views of Sailor Jerry high top chucks. 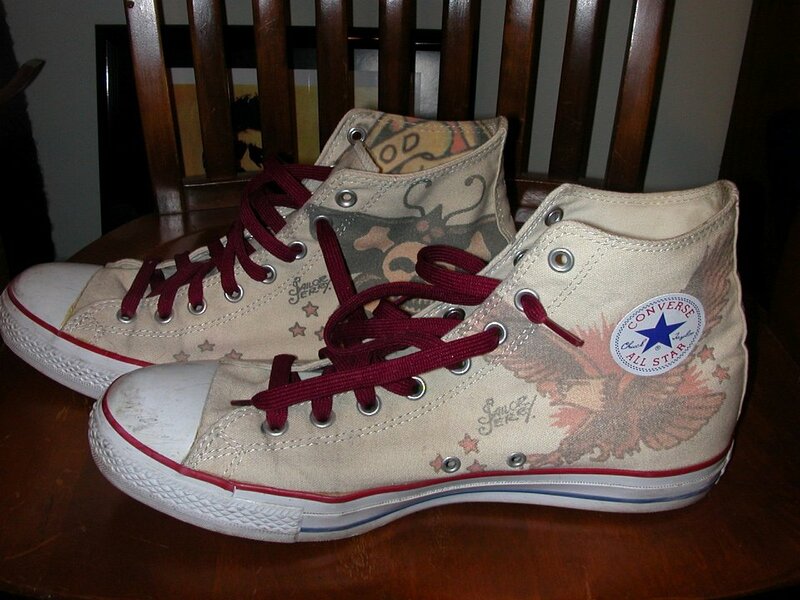 107 Brad Deniston Collection of Chucks Right side views of Sailor Jerry high top chucks. 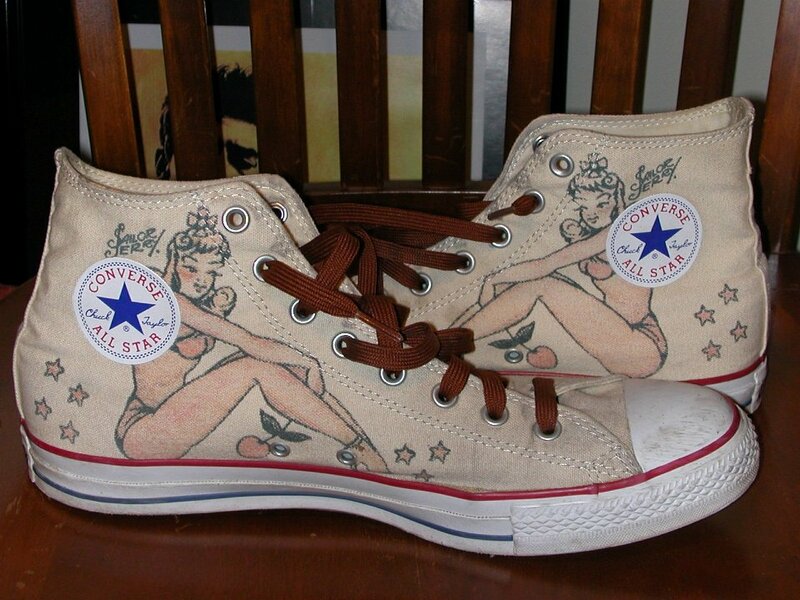 108 Brad Deniston Collection of Chucks Left side views of Sailor Jerry high top chucks. 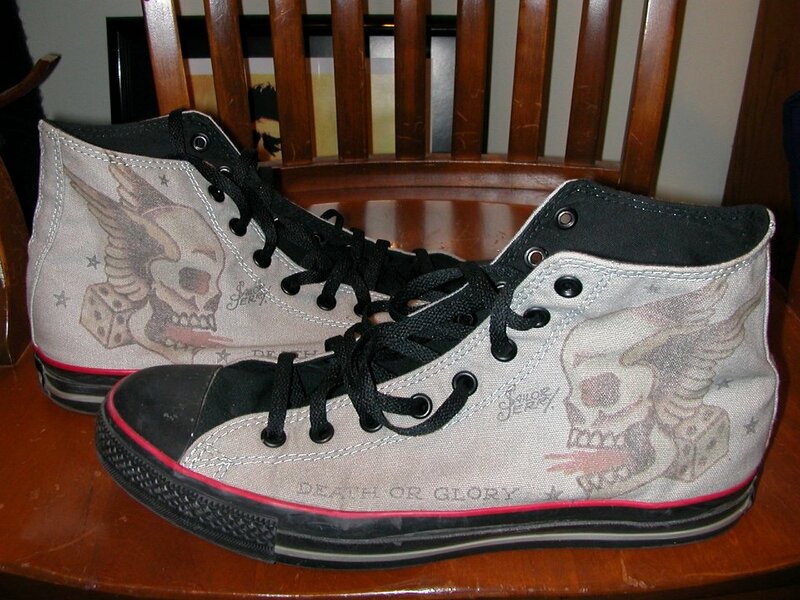 109 Brad Deniston Collection of Chucks Inside patch views of Sailor Jerry high top chucks. 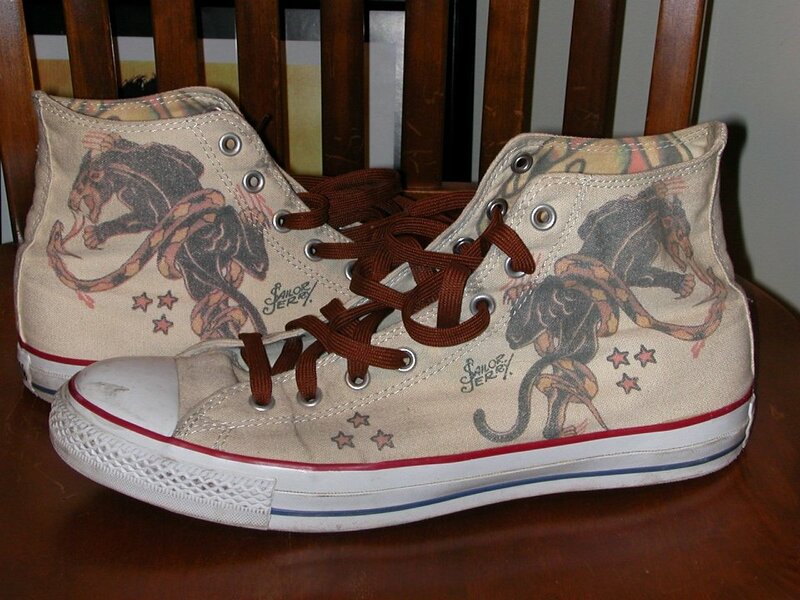 110 Brad Deniston Collection of Chucks Outide views of Sailor Jerry high top chucks. 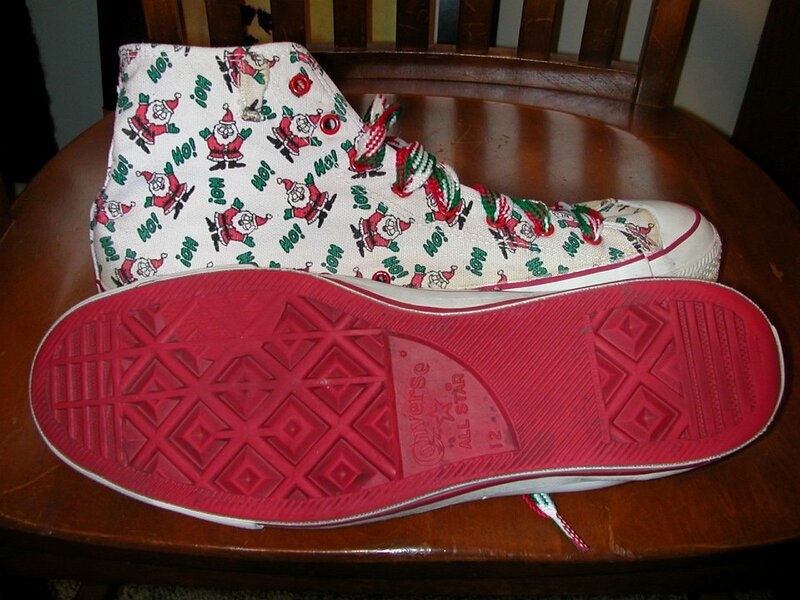 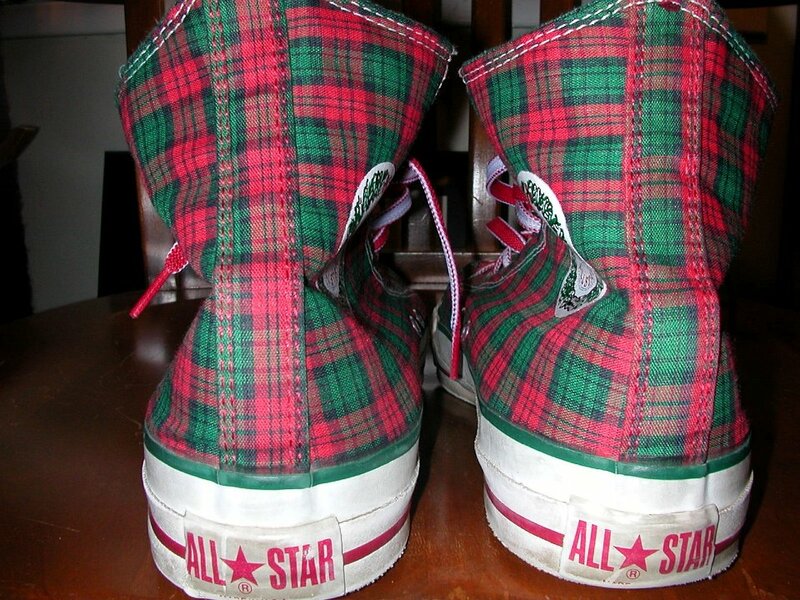 111 Brad Deniston Collection of Chucks Outside and sole views of Santa print high top chucks. 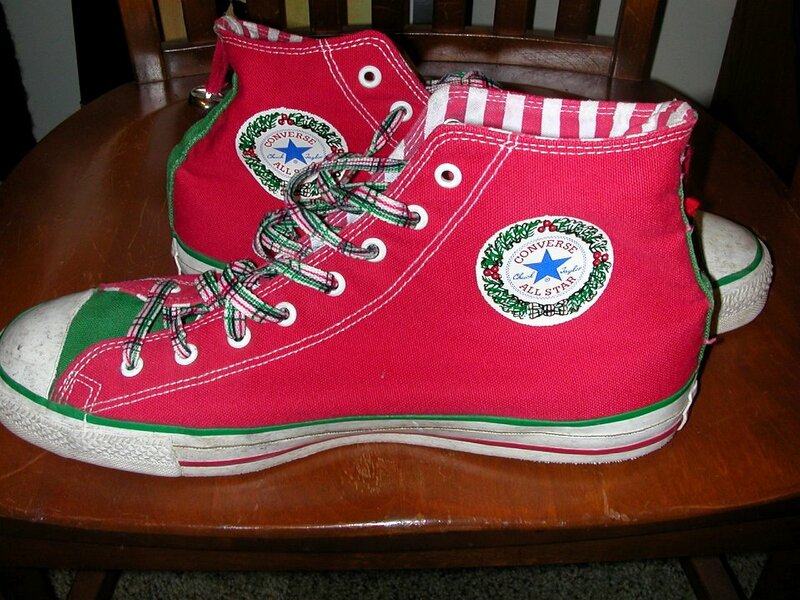 112 Brad Deniston Collection of Chucks Outside views of Santa print high top chucks. 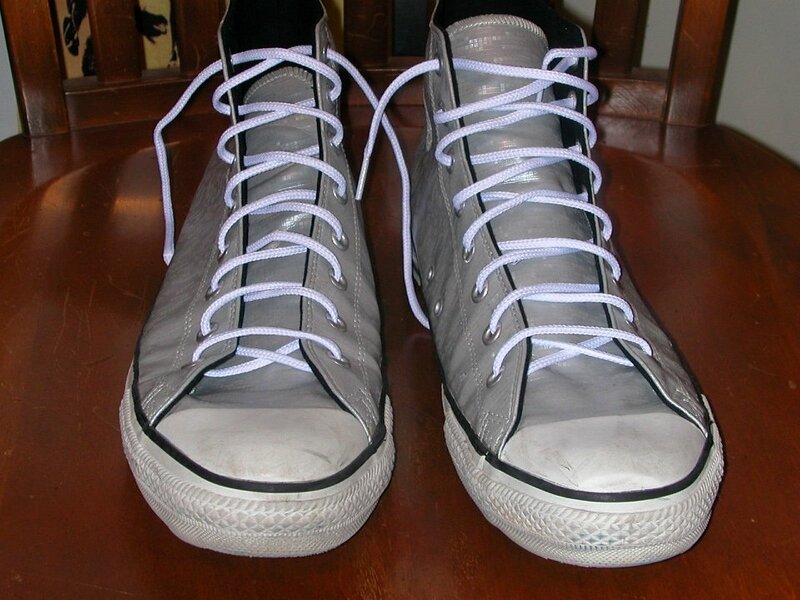 113 Brad Deniston Collection of Chucks Front view of silver vinyl high tops. 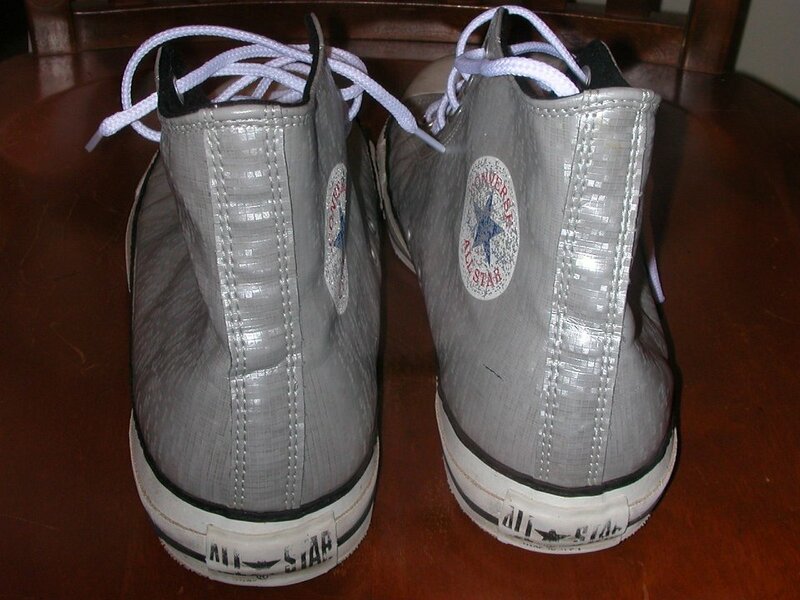 114 Brad Deniston Collection of Chucks Front and inside patch views of silver vinyl high tops. 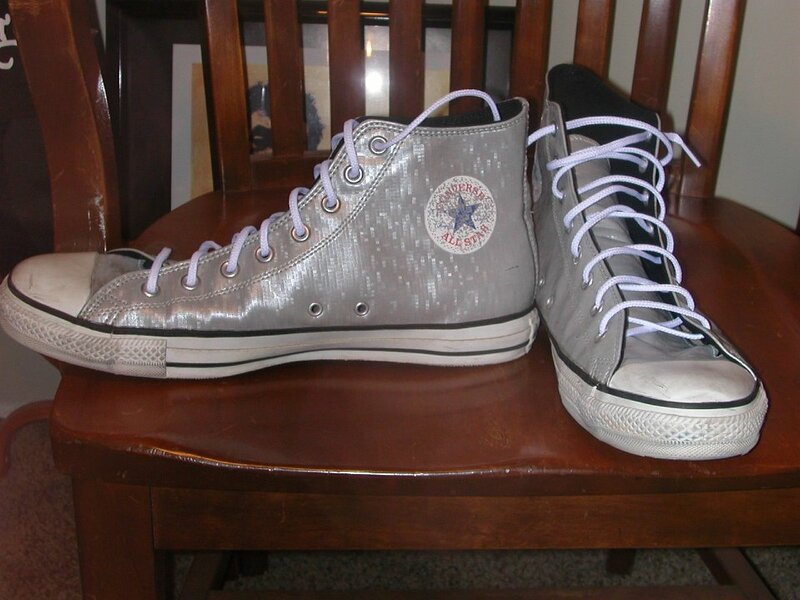 115 Brad Deniston Collection of Chucks Reart view of silver vinyl high tops. 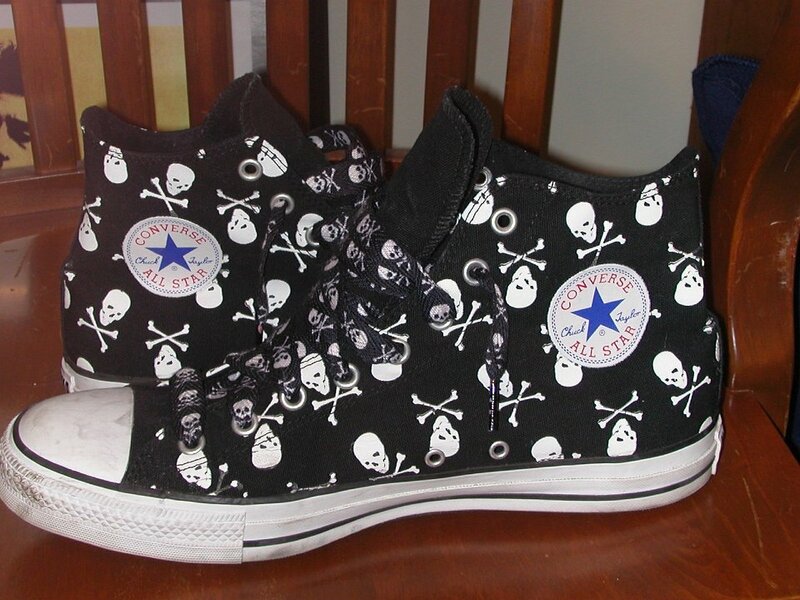 116 Brad Deniston Collection of Chucks Inside patch views of skull print chucks. 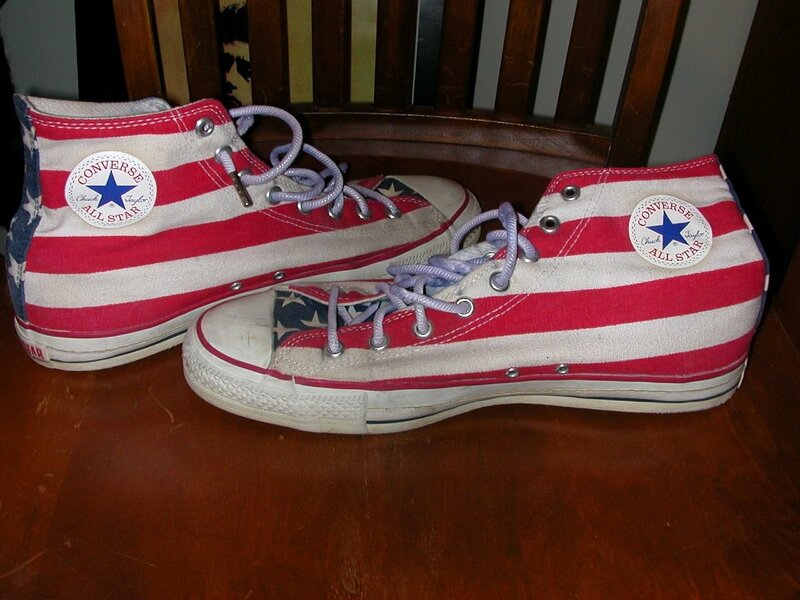 117 Brad Deniston Collection of Chucks Inside patch views of stars and bars high tops. 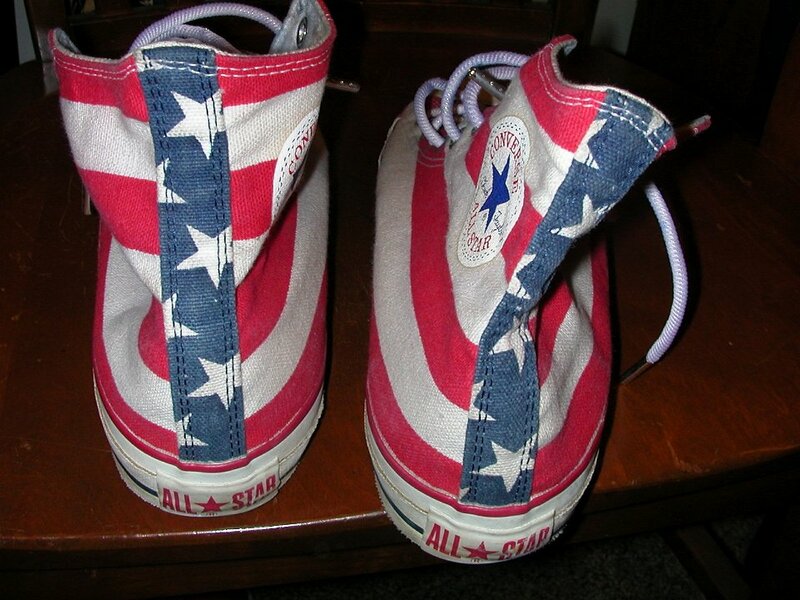 118 Brad Deniston Collection of Chucks Rear view of stars and bars high tops. 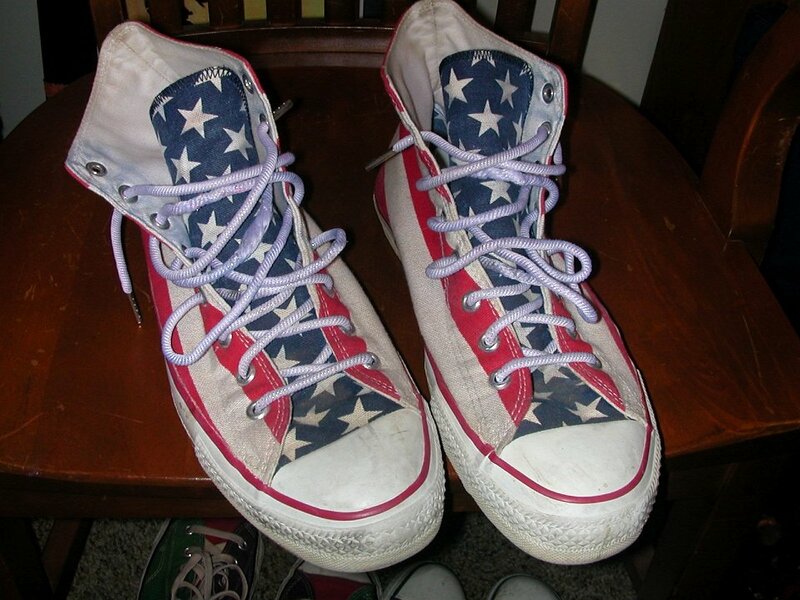 119 Brad Deniston Collection of Chucks Top view of stars and bars high tops. 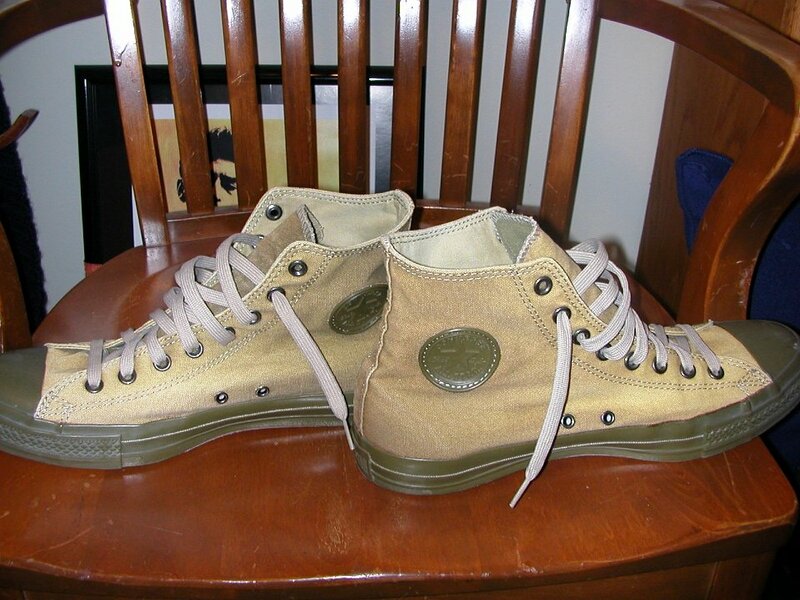 120 Brad Deniston Collection of Chucks Left side view of tan cargo high tops. 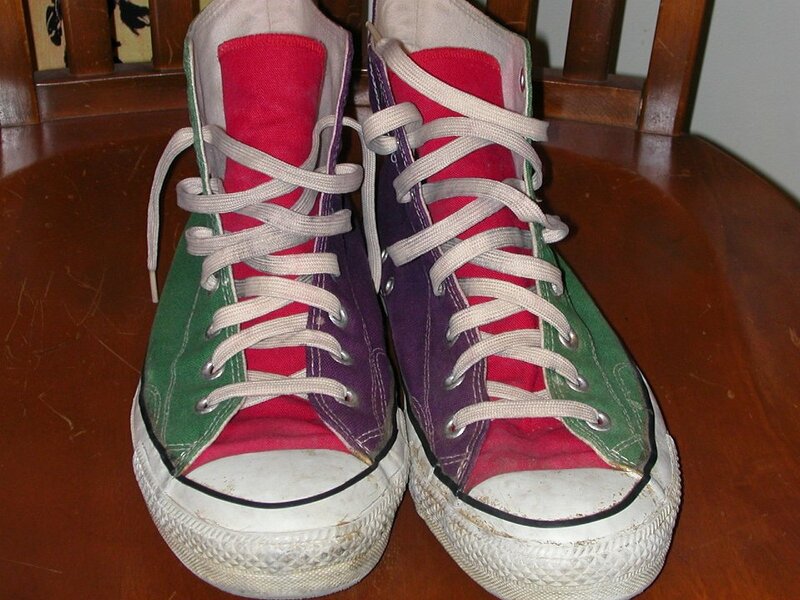 121 Brad Deniston Collection of Chucks Rear view of green, red and purple tricolor high tops. 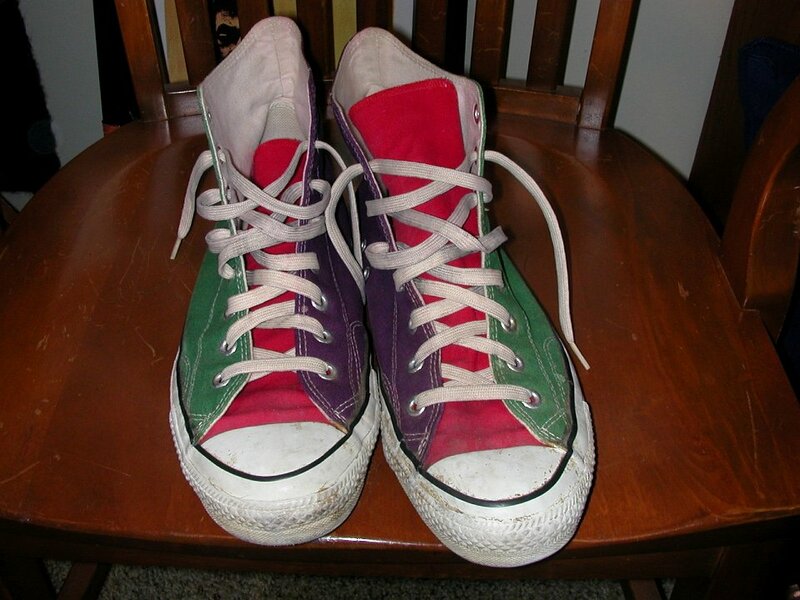 122 Brad Deniston Collection of Chucks Front view of green, red and purple tricolor high tops. 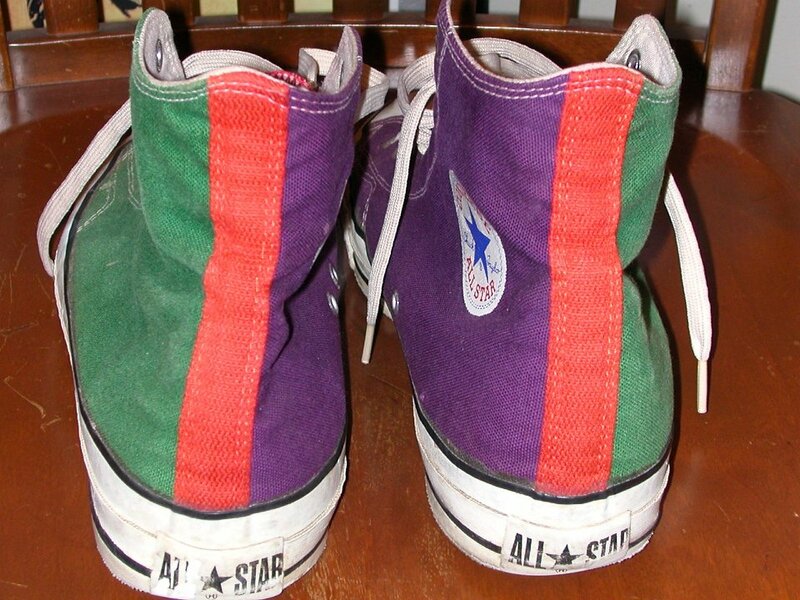 123 Brad Deniston Collection of Chucks Left side view of green, red and purple tricolor high tops. 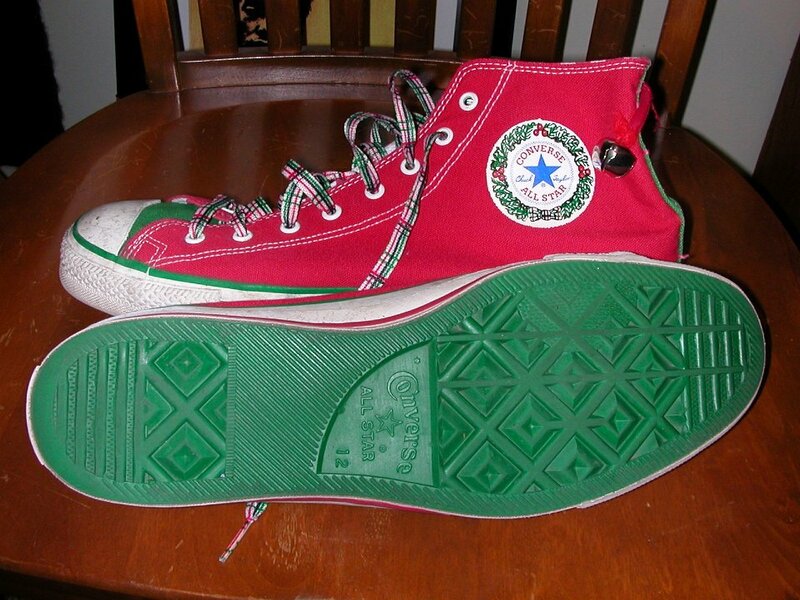 124 Brad Deniston Collection of Chucks inside patch views of green, red and purple tricolor high tops. 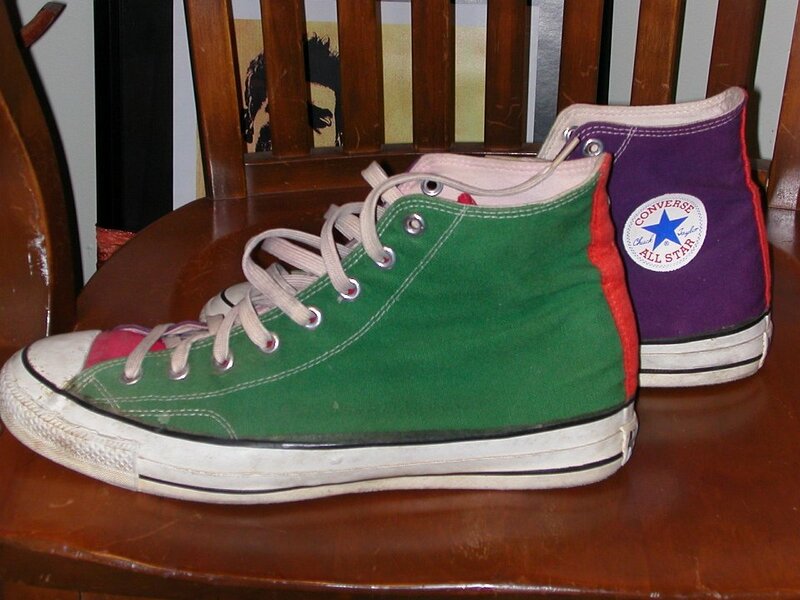 125 Brad Deniston Collection of Chucks Top view of green, red and purple tricolor high tops. 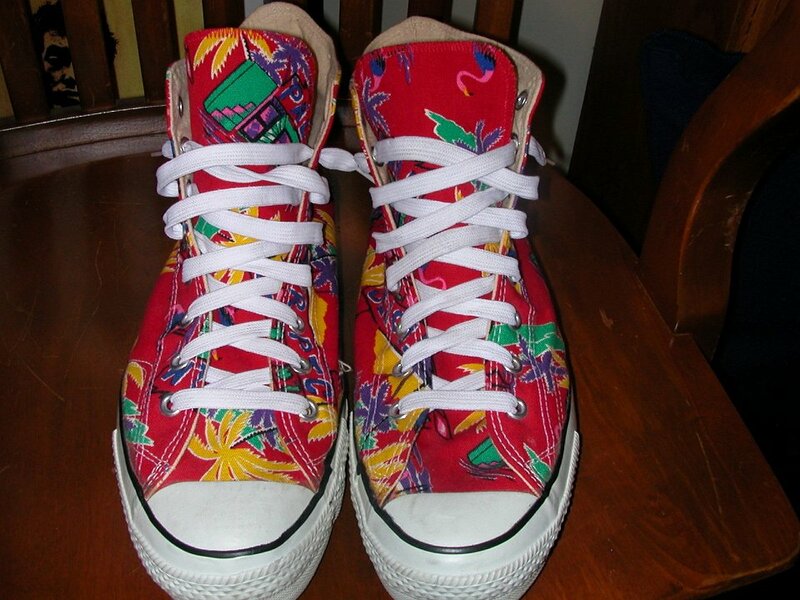 126 Brad Deniston Collection of Chucks Front view of tropcial print high tops. 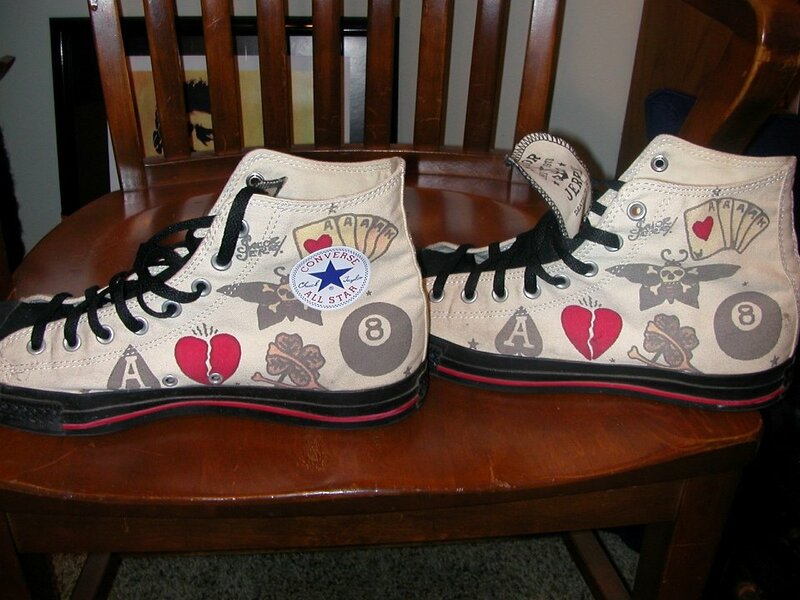 127 Brad Deniston Collection of Chucks inside patch views of tropcial print high tops. 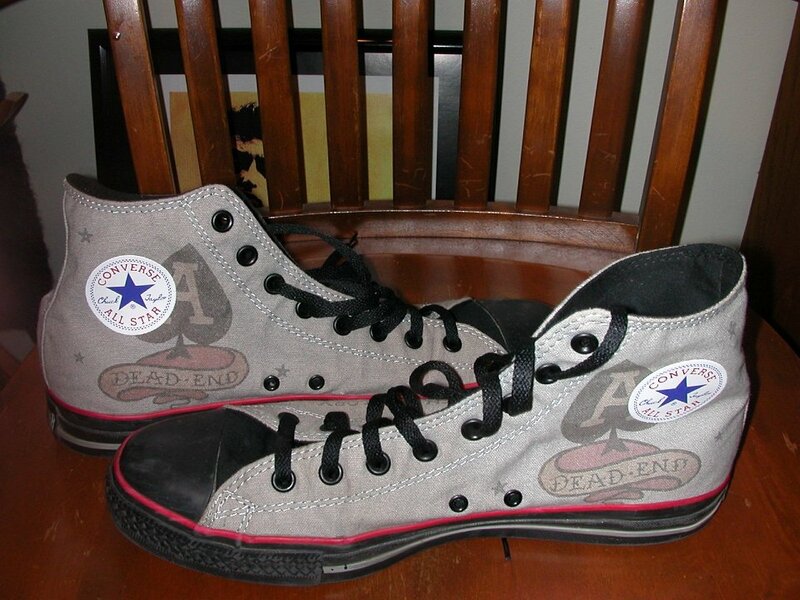 128 Brad Deniston Collection of Chucks Rear view of tropcial print high tops. 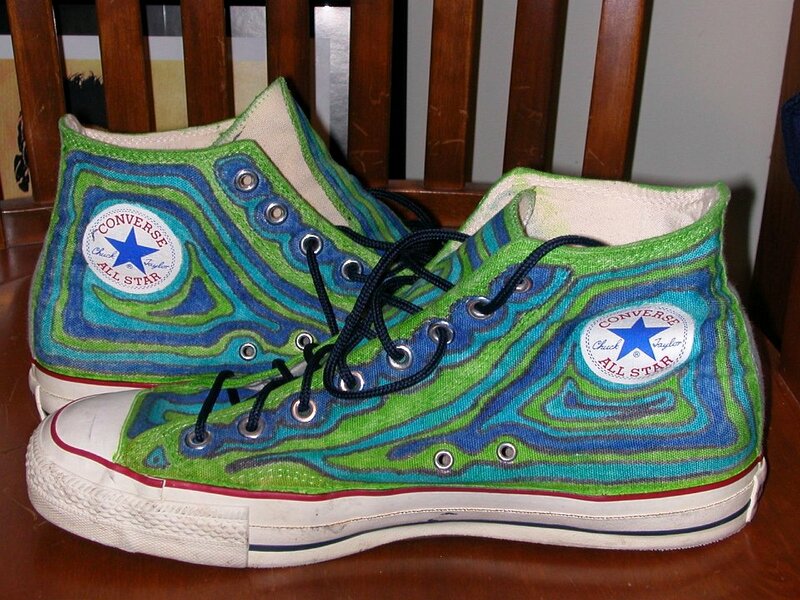 129 Brad Deniston Collection of Chucks Top view of tropcial print high tops. 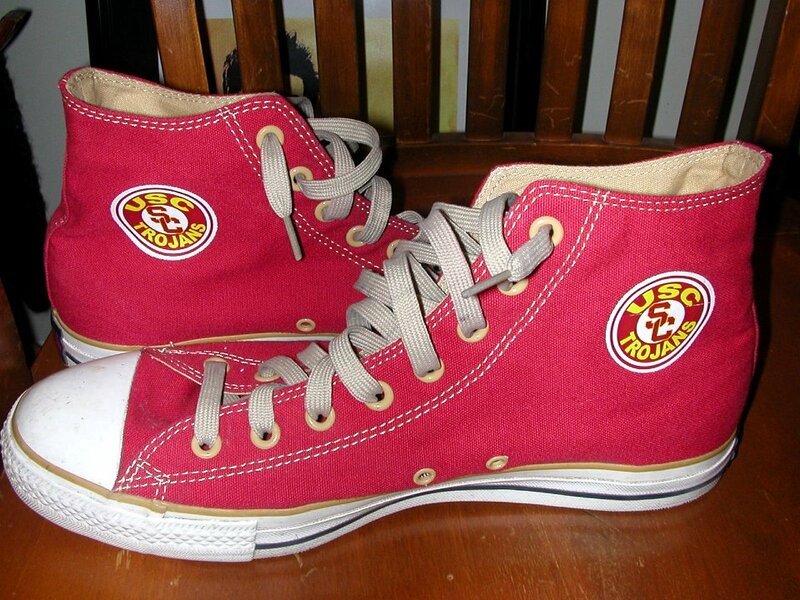 130 Brad Deniston Collection of Chucks Inside patch view of red USC high tops. 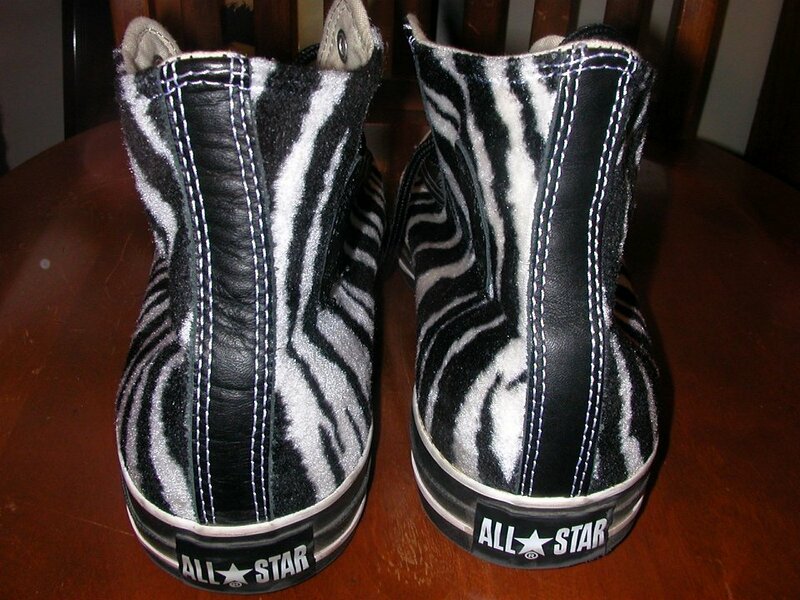 131 Brad Deniston Collection of Chucks Rear view of zebra prinit high tops. 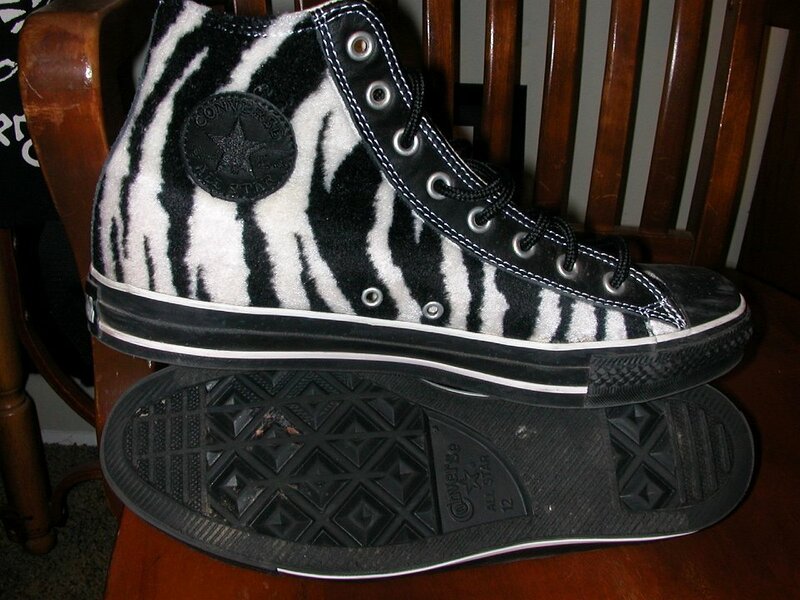 132 Brad Deniston Collection of Chucks inside patch and sole views of zebra prinit high tops.